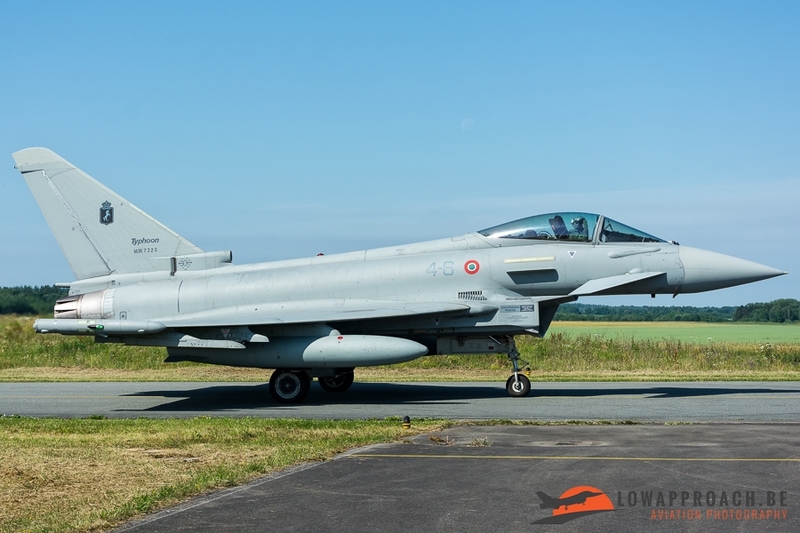 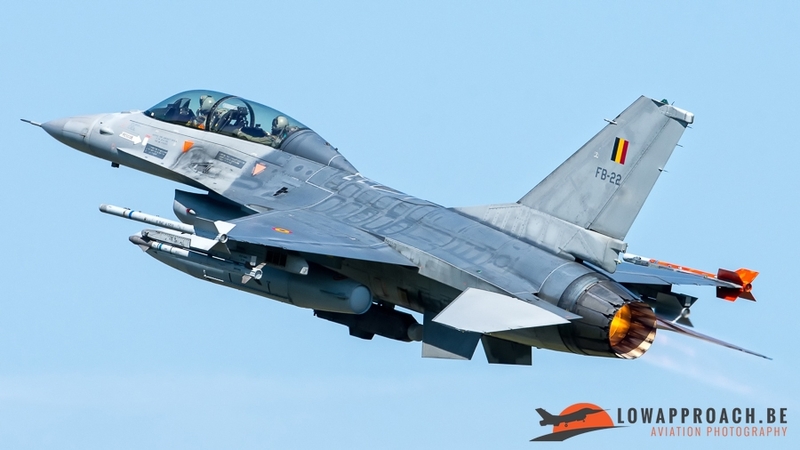 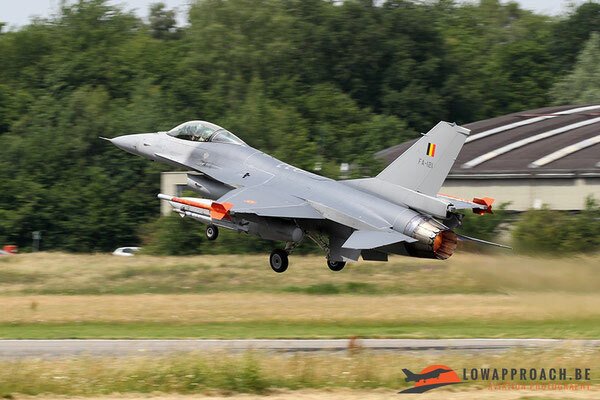 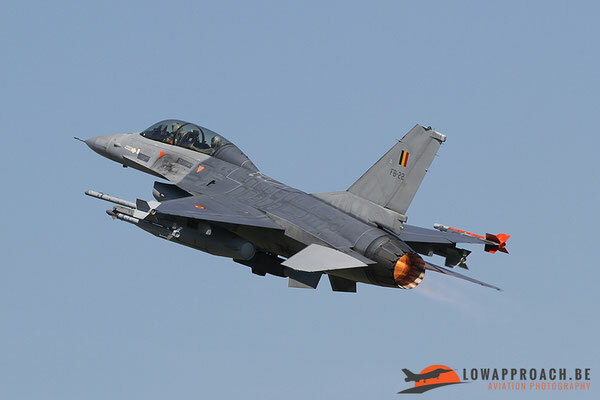 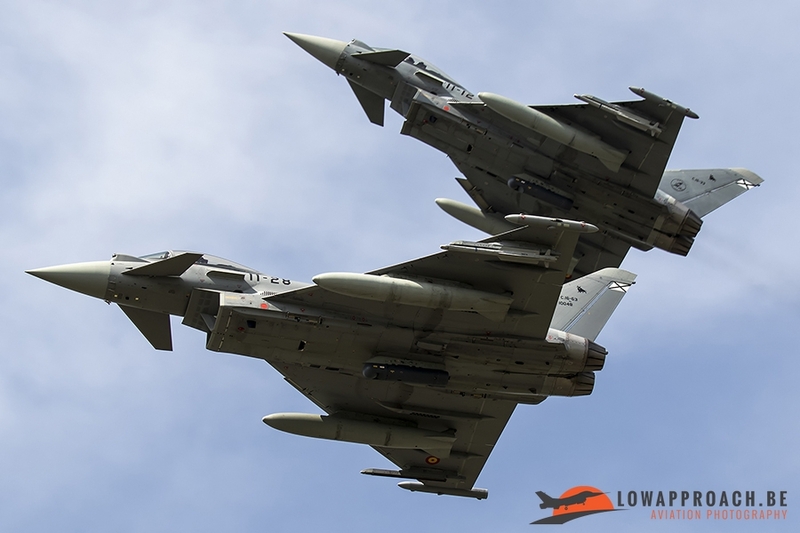 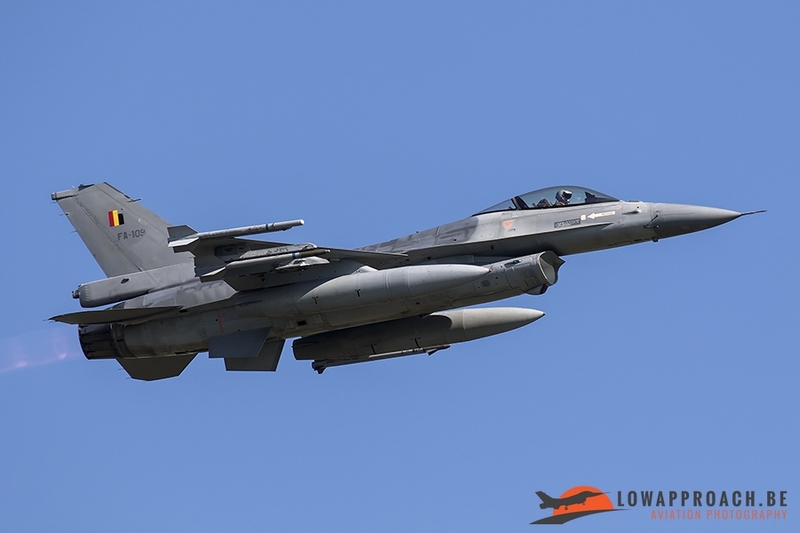 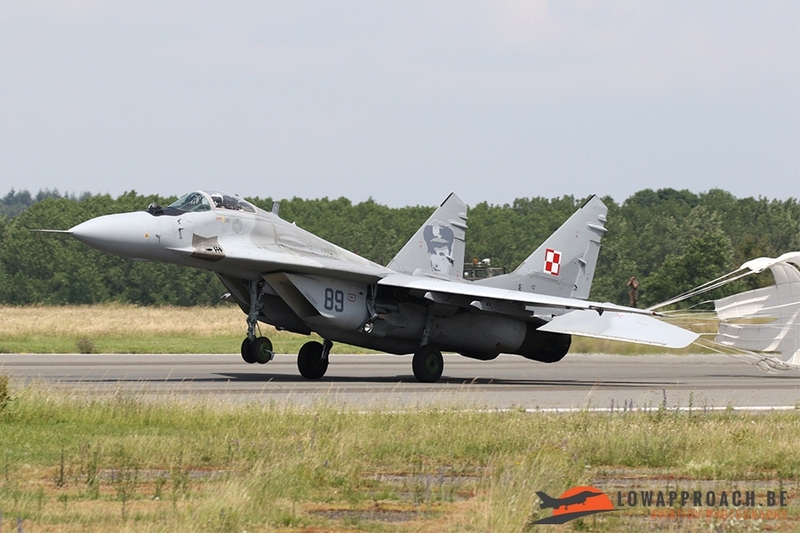 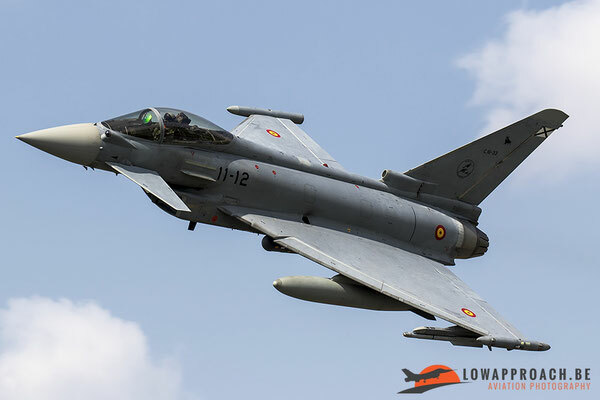 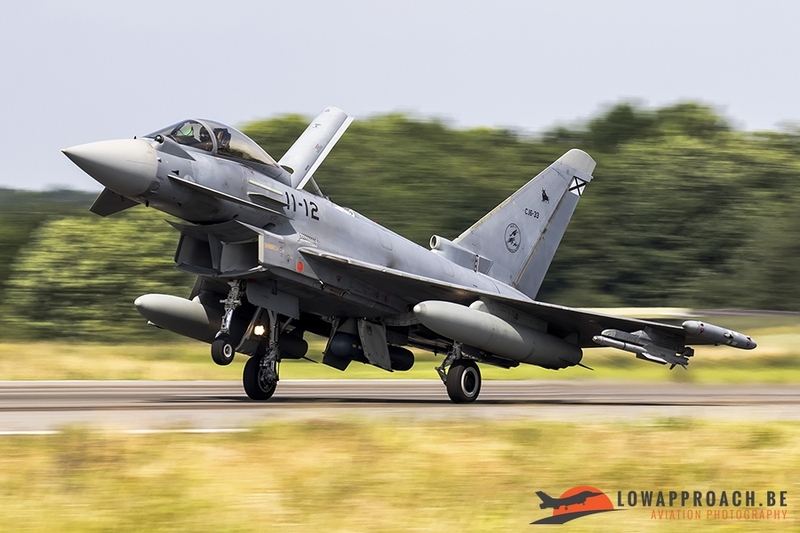 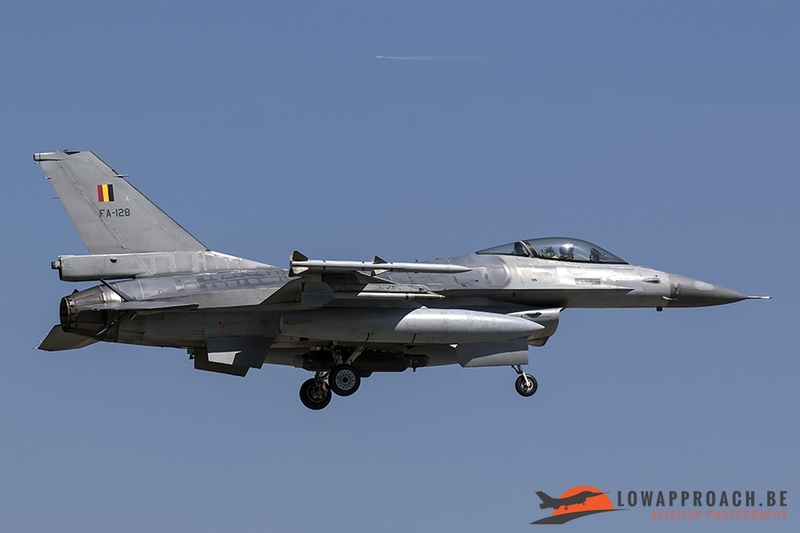 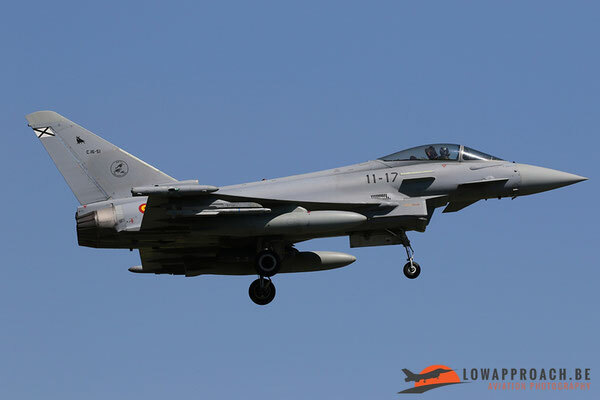 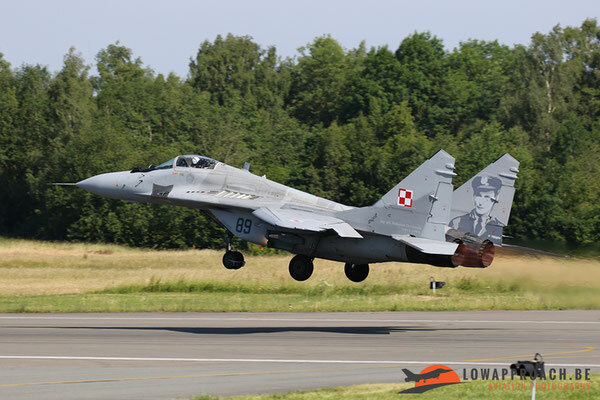 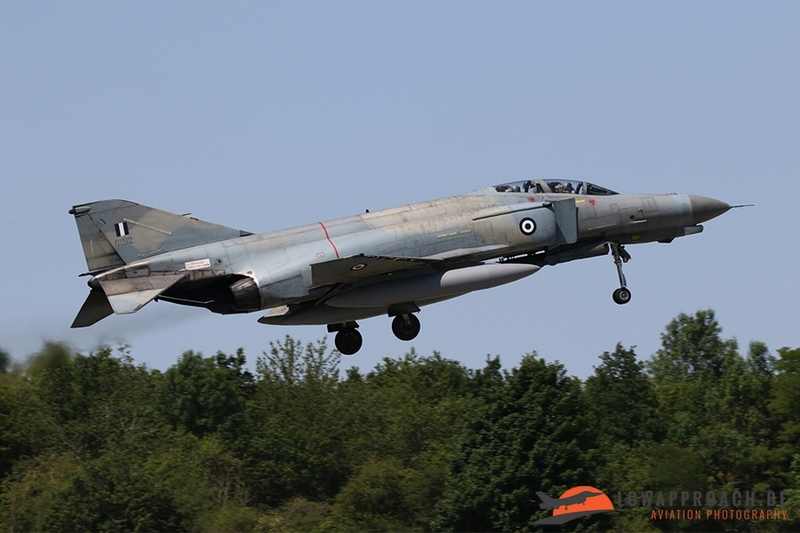 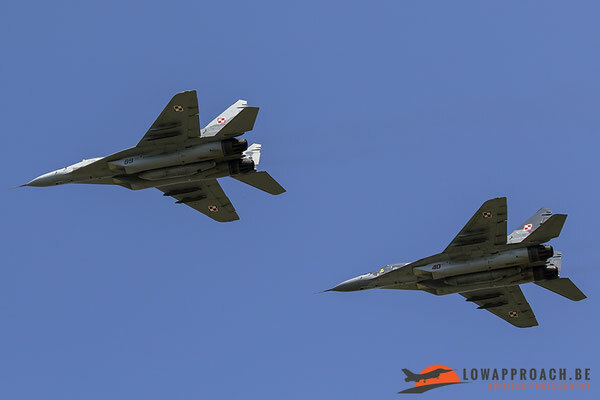 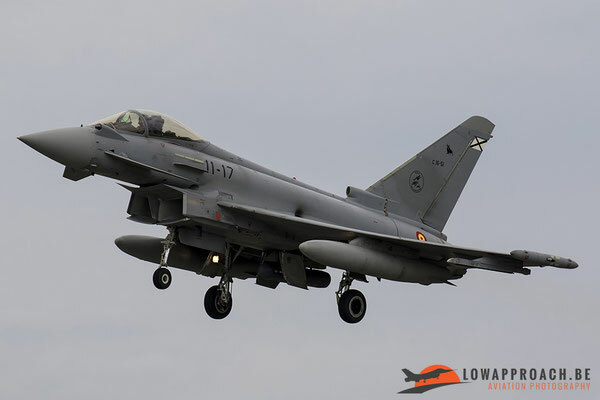 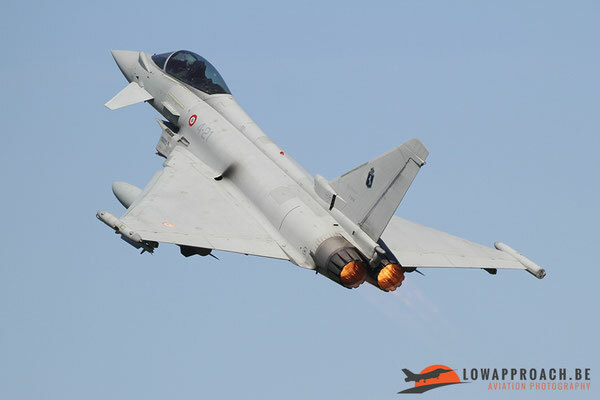 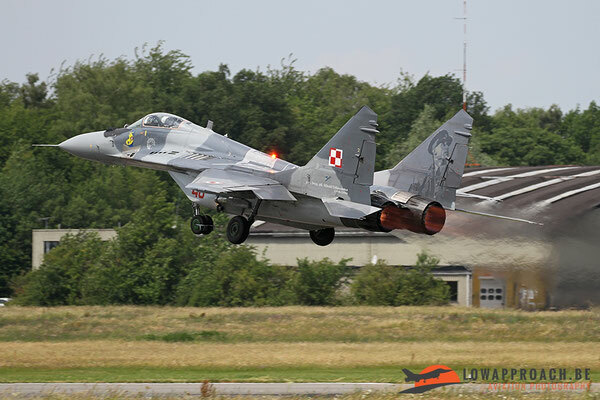 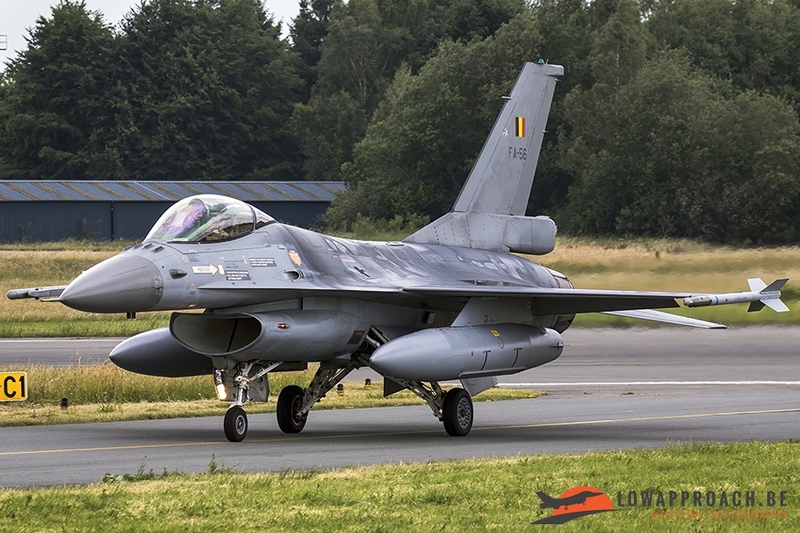 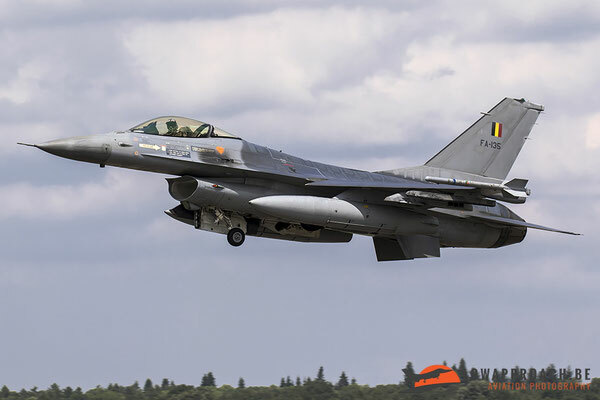 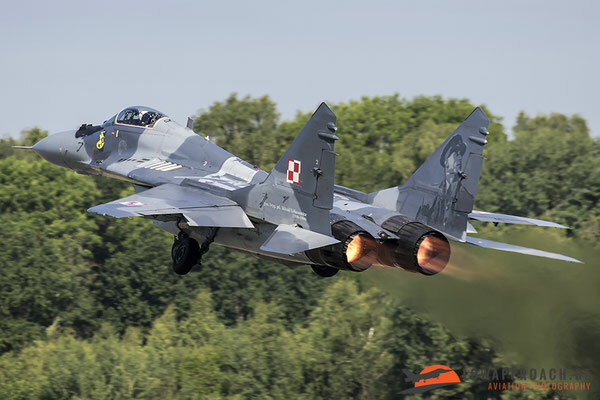 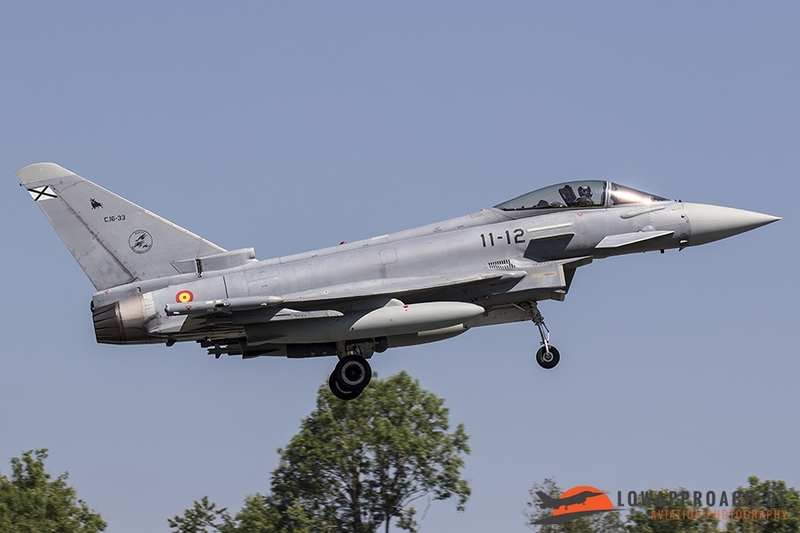 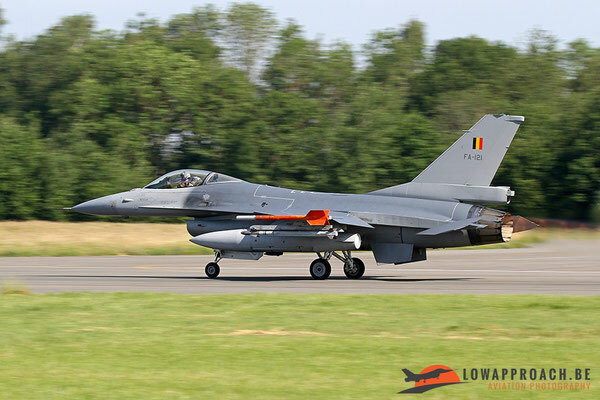 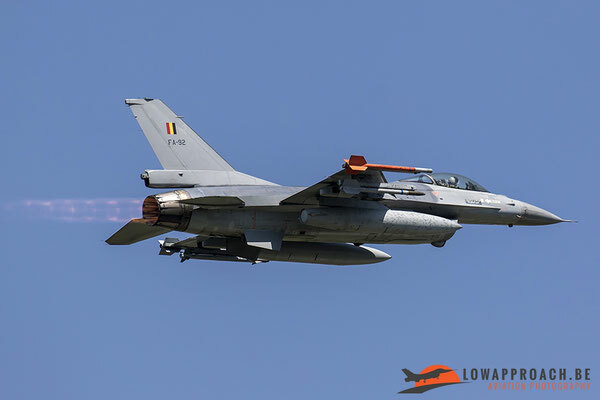 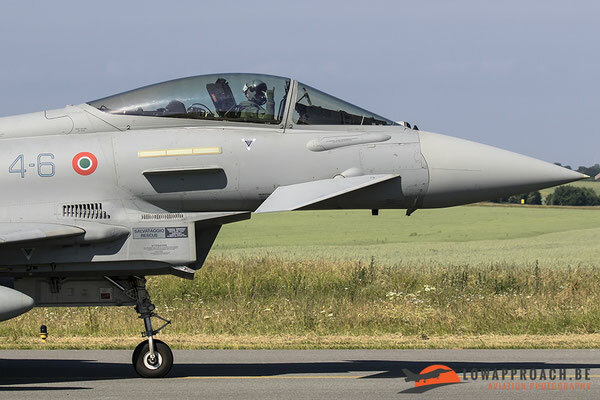 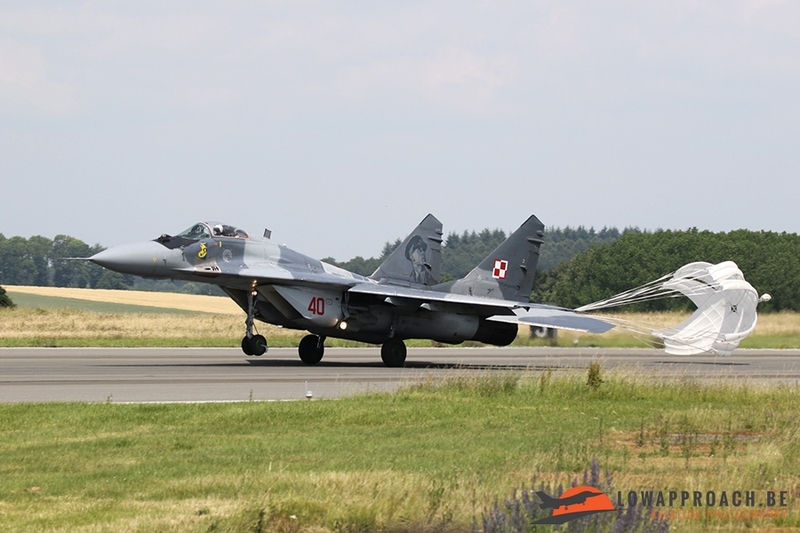 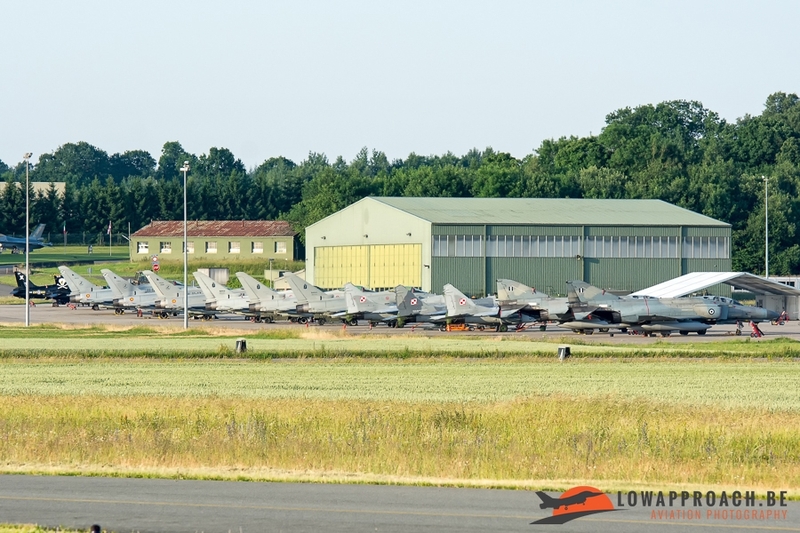 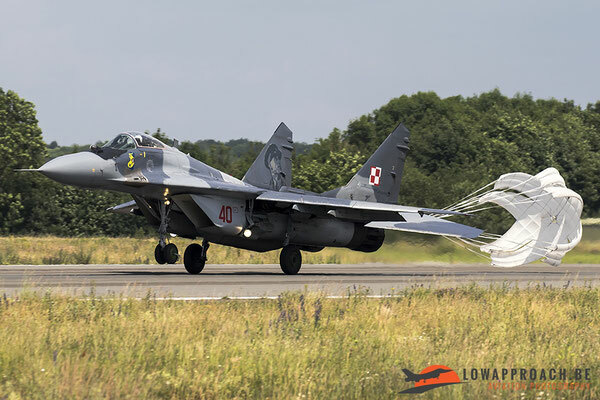 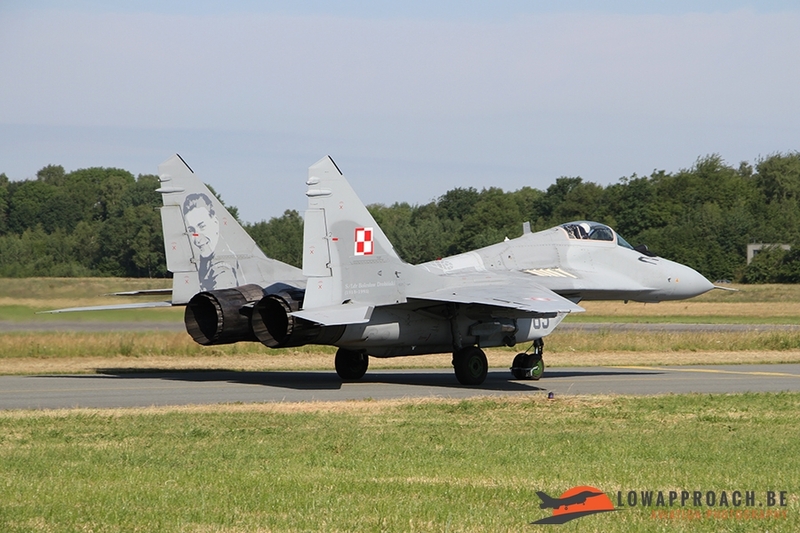 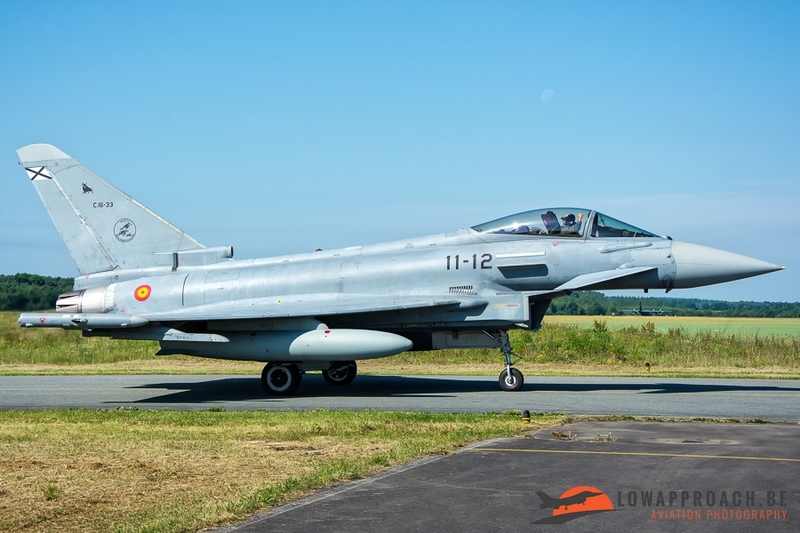 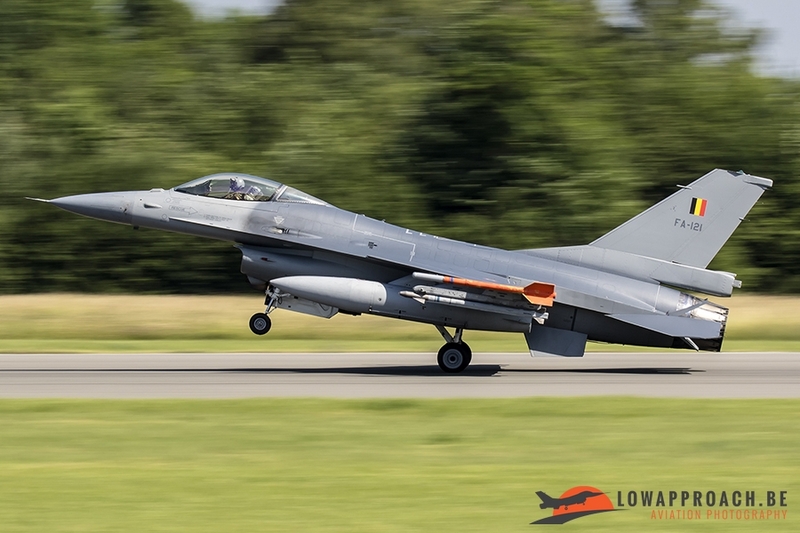 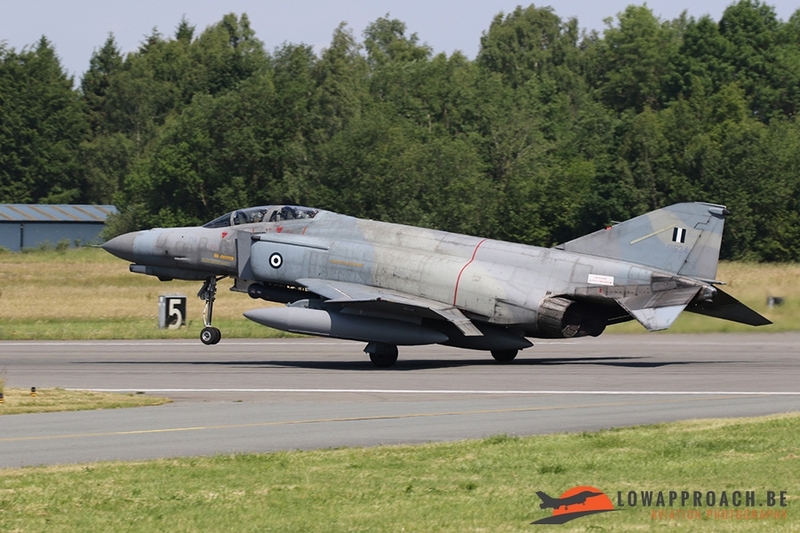 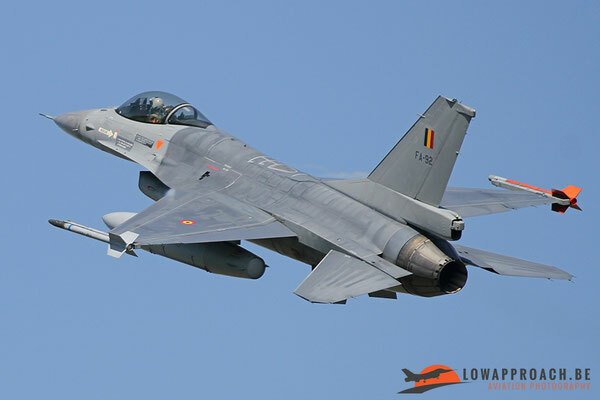 Between June 7th and 16th the Tactical Weapons Meet was held at Florennes airbase. This exercise was created as part of the 1st Squadron “Stingers” centenary which is based at Florennes. 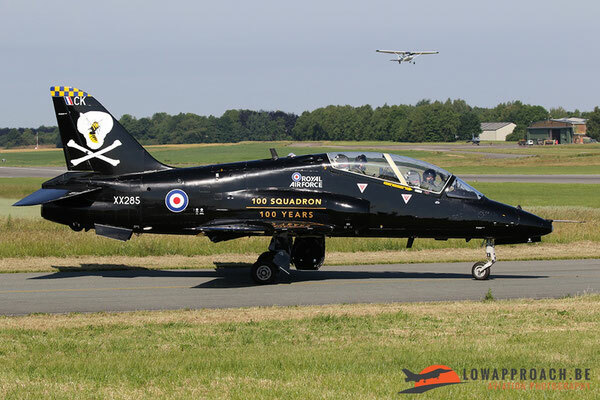 The squadron was created in 1917 during WWI, from then on also the squadron’s emblem, the thistle was being used. 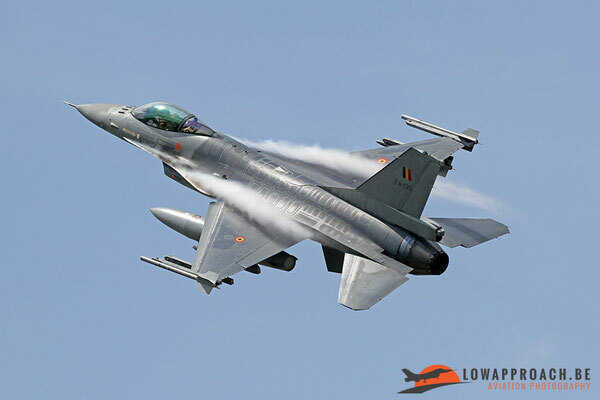 The emblem itself was designed by André De Meulemeester, and later re-designed by Willy Coppens, both WWI aces. To commemorate this centenary the squadron was given permission to paint one of the 2nd Wing’s F-16’s in their squadron markings. 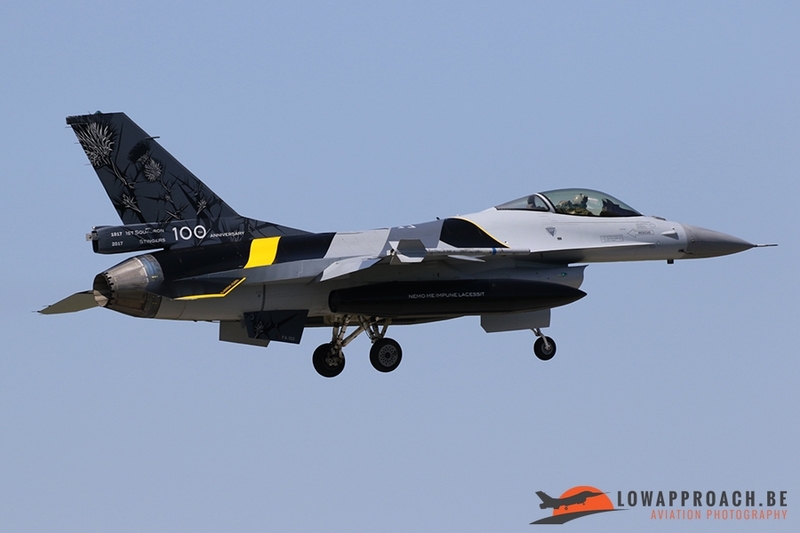 The F-16 used for their anniversary was the FA-132. Apart from the squadron’s emblem that was painted on the Fighting Falcon, also their motto “Nemo me impune lacessit”, which means “no-one can challenge me unpunished” was painted on the fuel tanks. 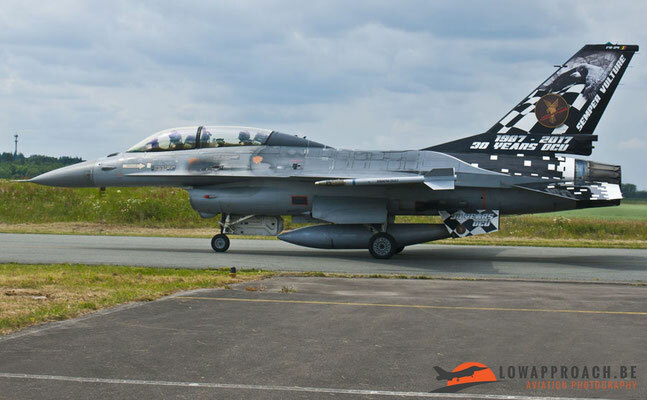 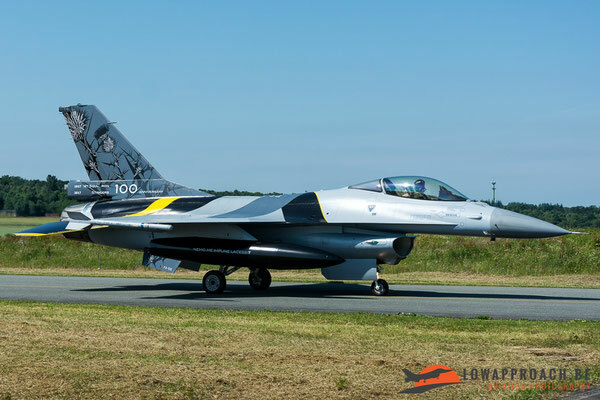 The special painted F-16 was nicknamed “Blackbird”. 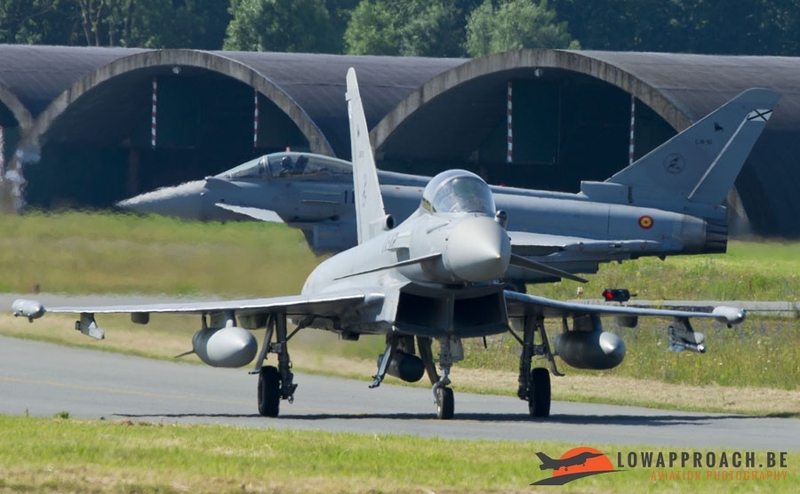 Low Approach attended the exercise for 3 days. 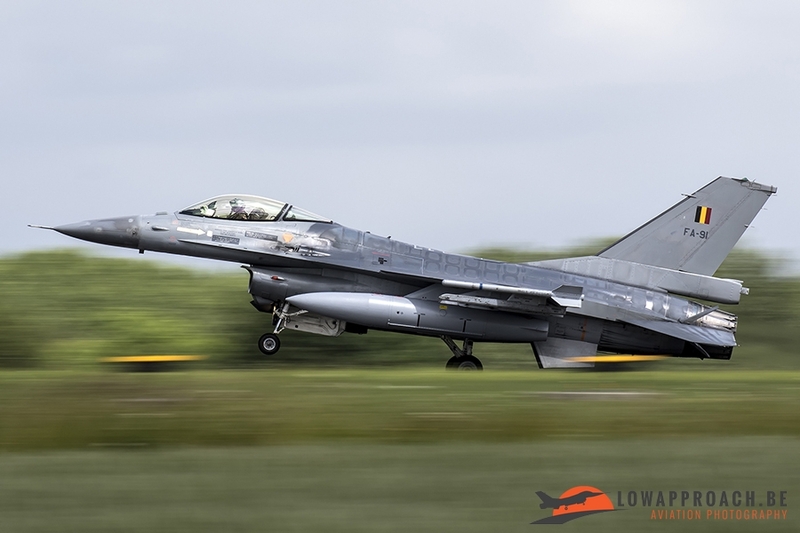 2 days of old school spotting outside the base near the fence, just like in the good old days when the TLP was still held at Florennes. As a matter of fact, the TWM was the first big exercise that was held at Florennes since the TLP moved to Albacete in Spain. On the 13th and 14th of June Edwin and Tim followed the exercise from near the fence. 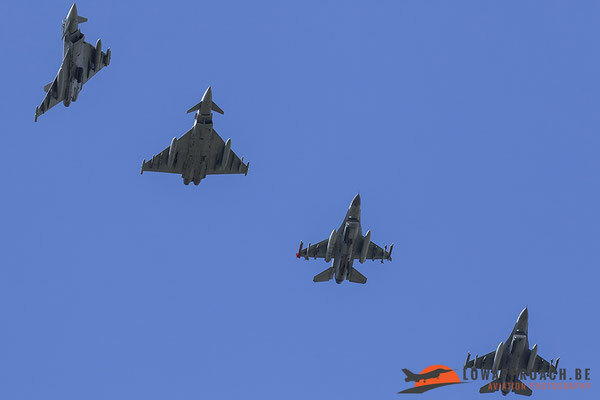 During the exercise, 2 waves are flown. 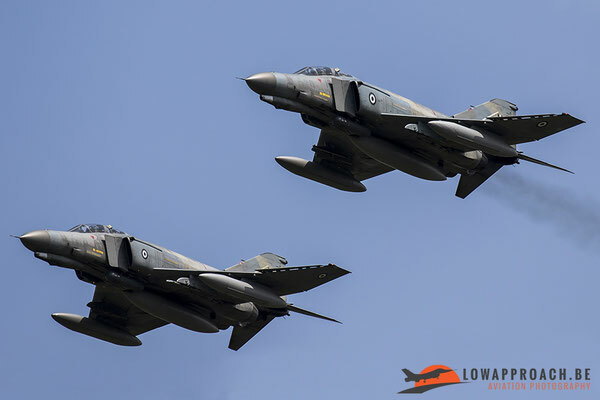 One in the morning and one in the afternoon. 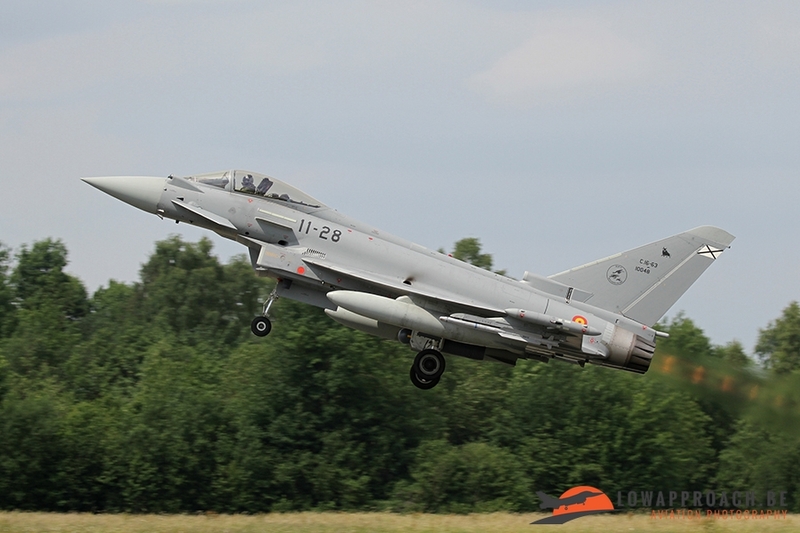 For the exercise the 1st squadron had invited several countries. 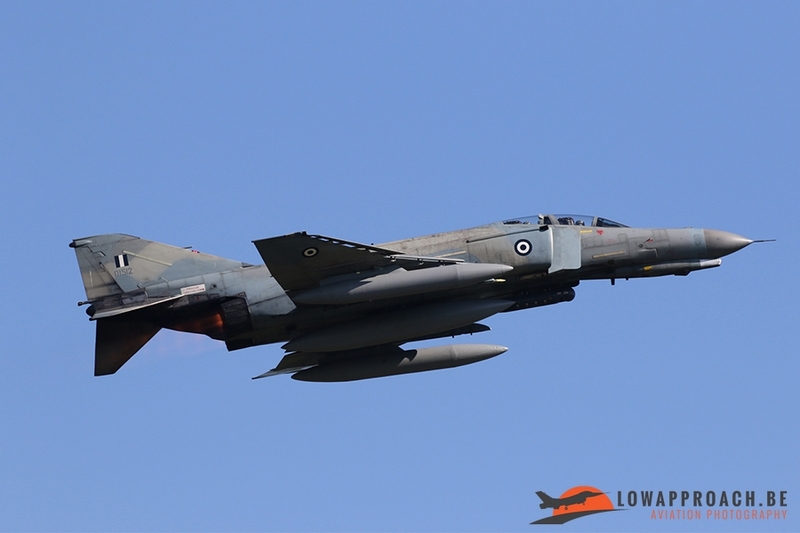 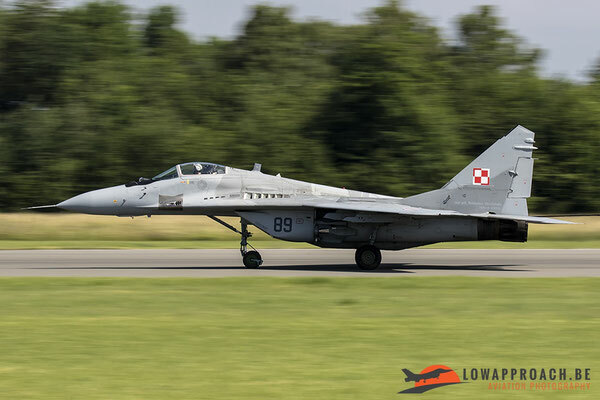 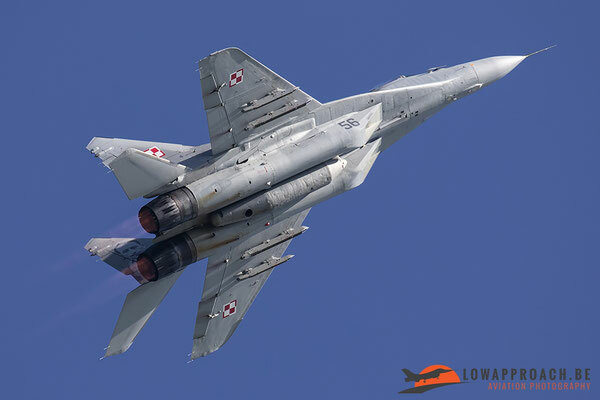 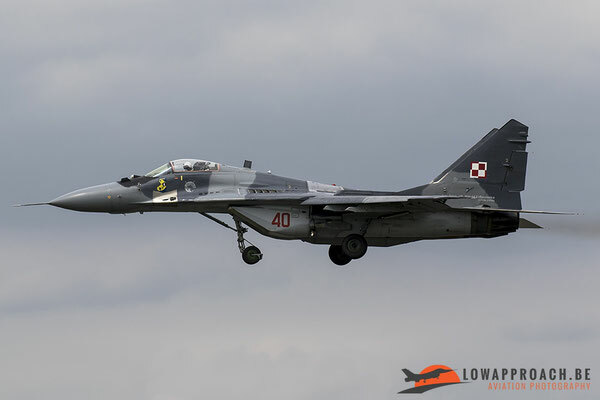 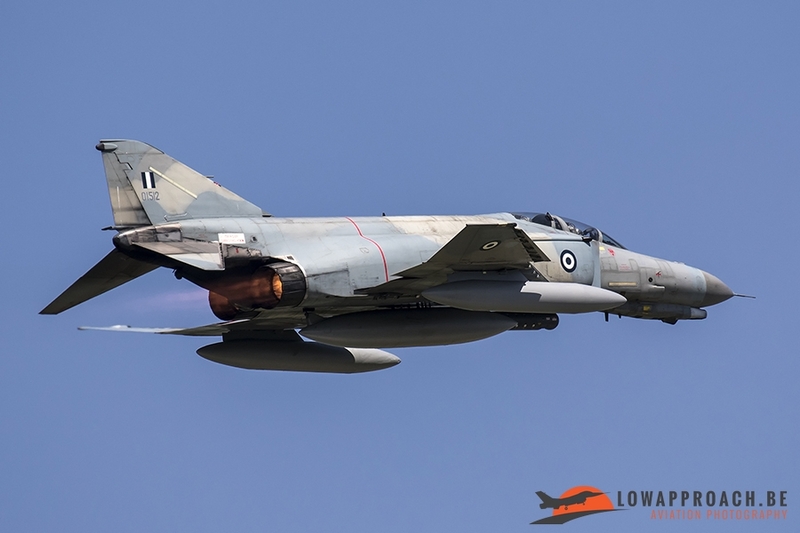 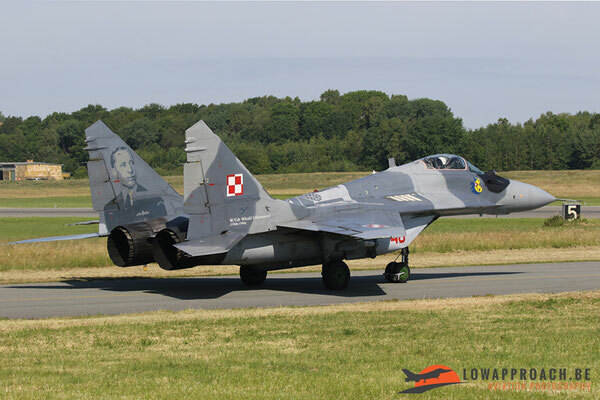 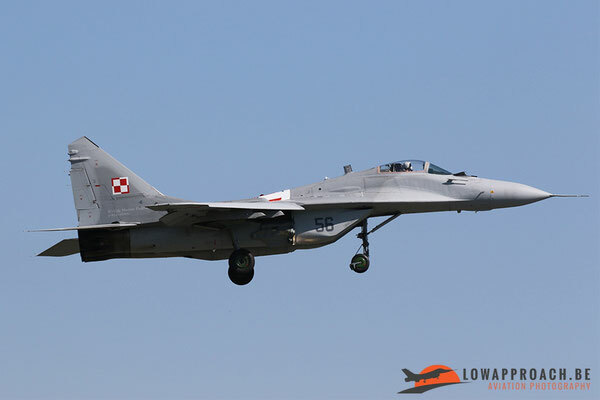 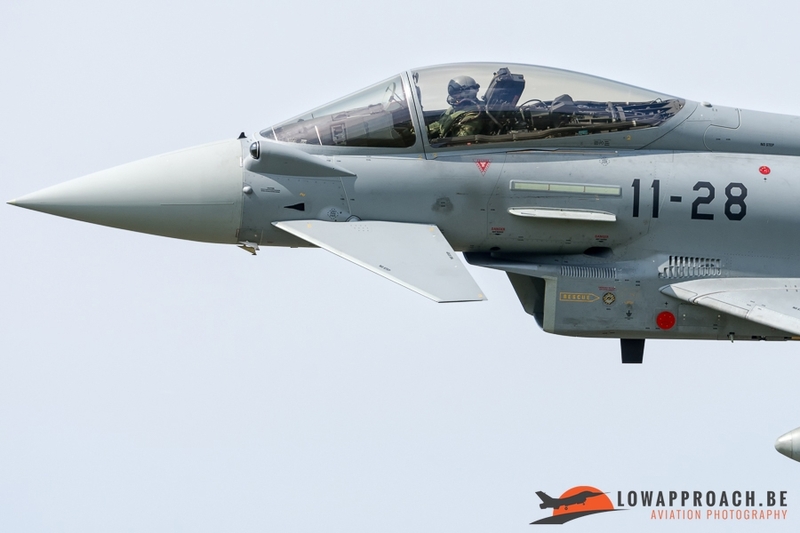 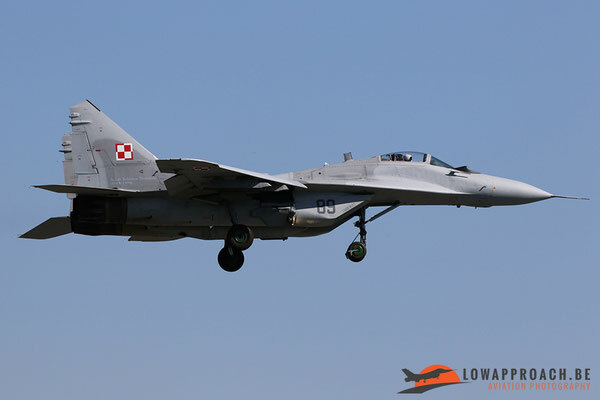 The ones that attended the Tactical Weapon Meet were Spain and Italy with the Typhoon, the UK with the Hawk T.1, Poland with the MiG-29A and finally Greece with the F-4E. 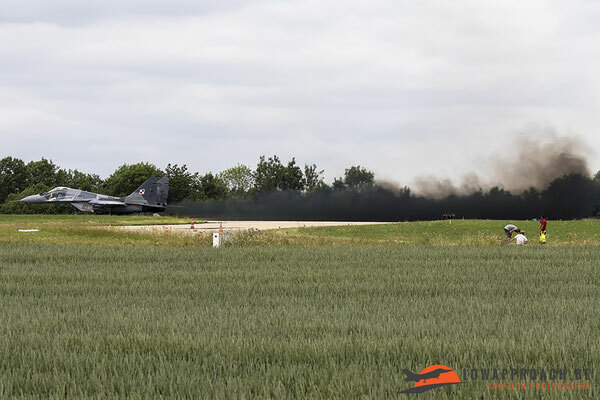 On the 13th, runway 26R was in use. For the spotters amongst us that visited the TLP in the past, this was probably the most preferred runway because you can position yourself along the fence and even make taxi shots from aircraft before they lined up on the runway. Sadly, during the TWM-exercise the runway along the fence was out of use due to works next to this taxiway so only landing shots were possible. 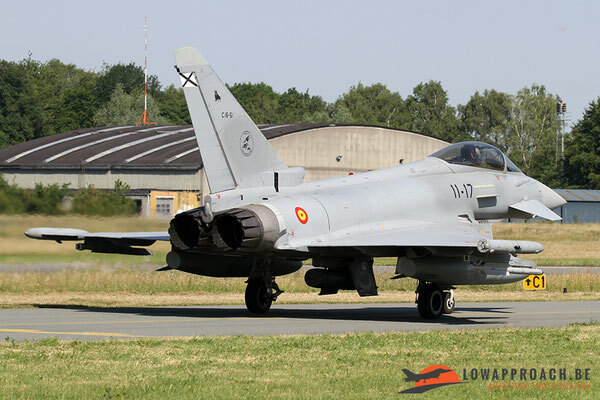 On the 14th the other runway was in use, this being runway 08L. 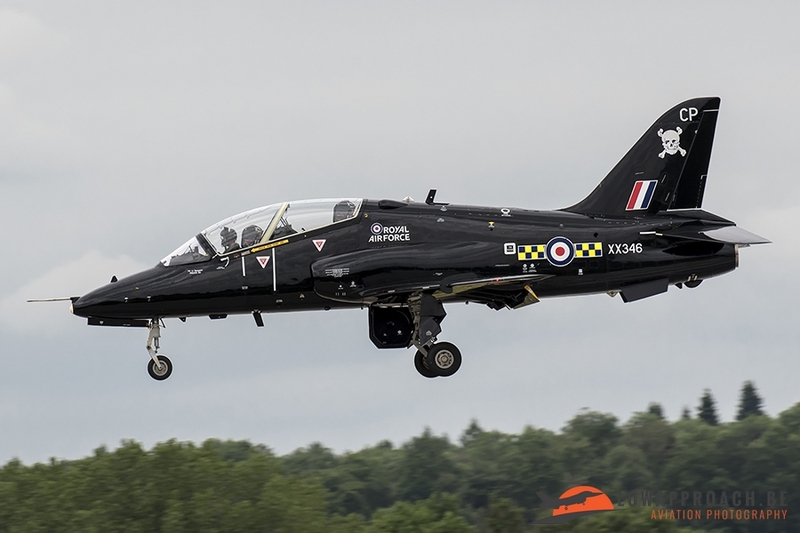 For the morning take-off’s Edwin and Tim drove to the other side and positioned themselves next to the threshold of runway 26R to photograph the aircraft taking off. After the last plane from the morning wave took off they both drove to runway 08 and walked to the meadow from where they could capture the participating planes when they returned from their morning mission. 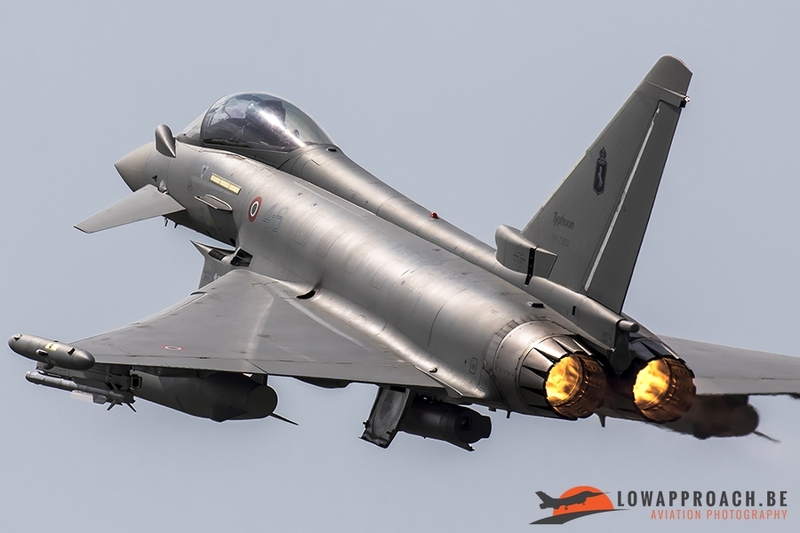 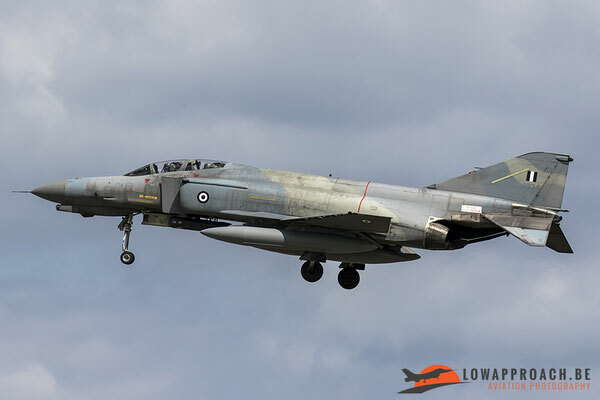 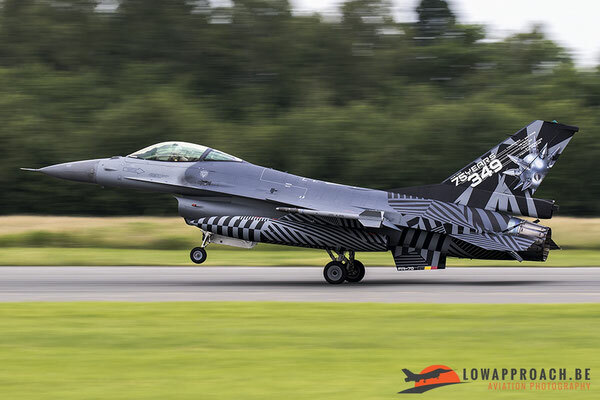 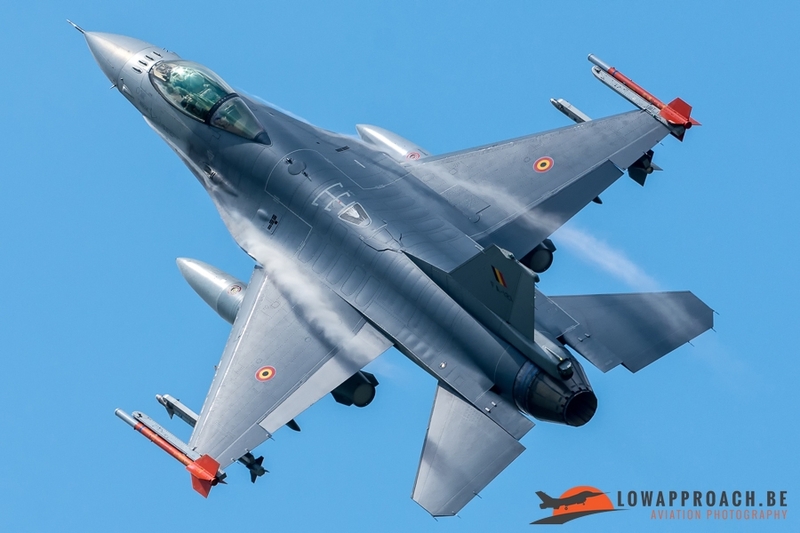 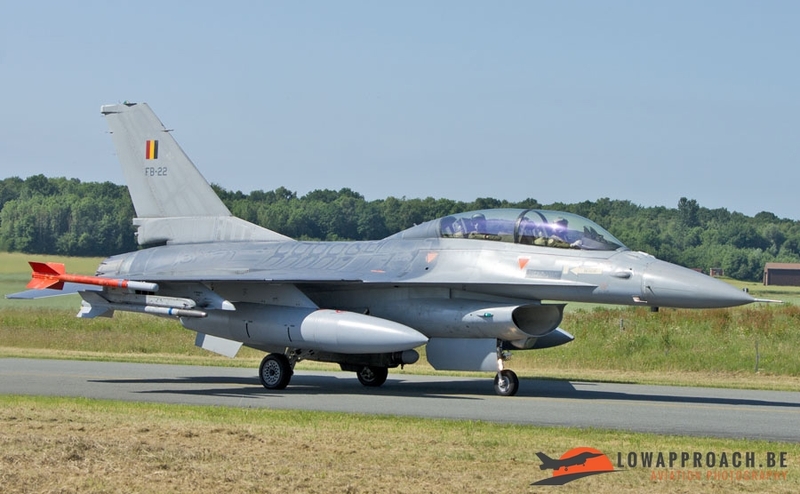 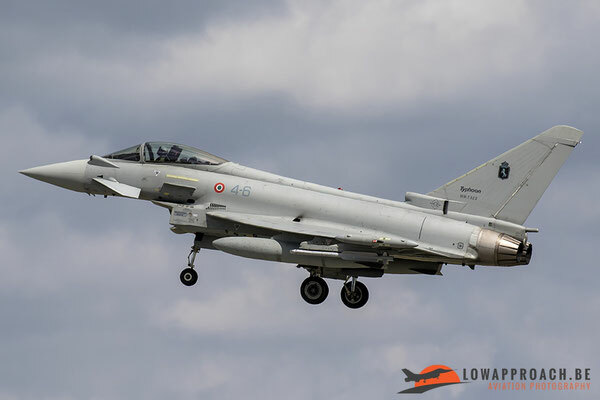 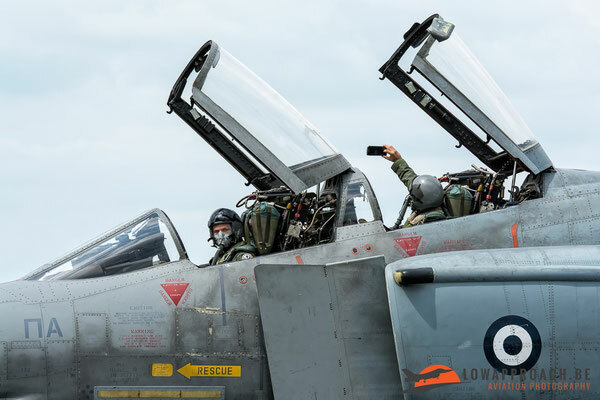 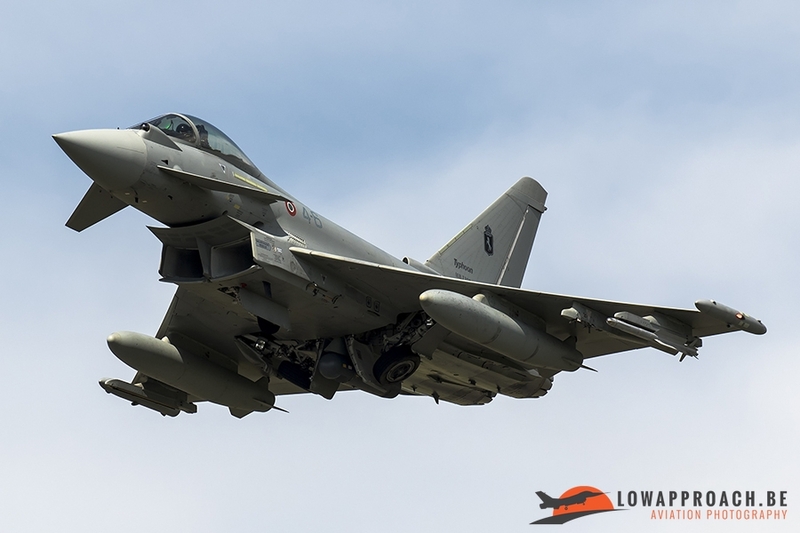 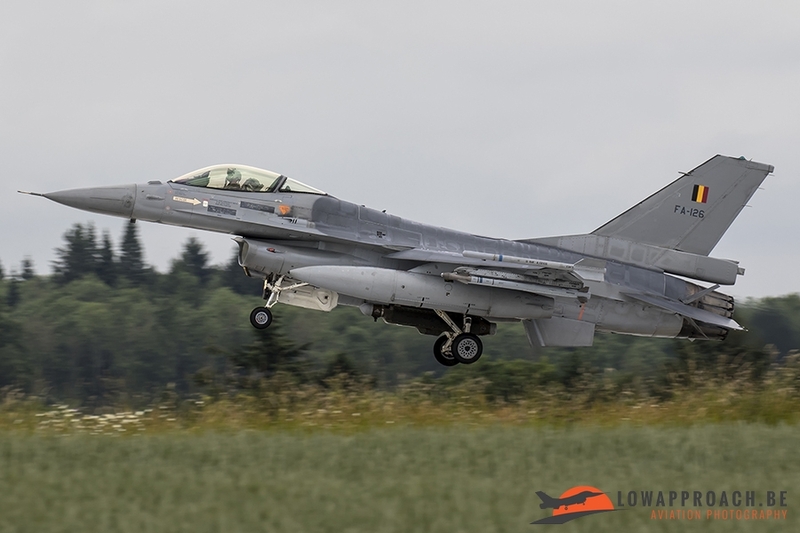 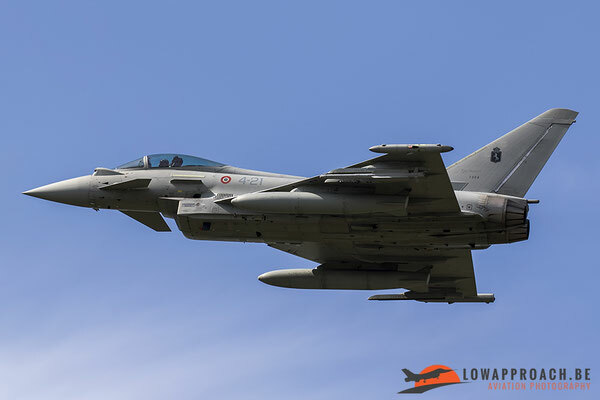 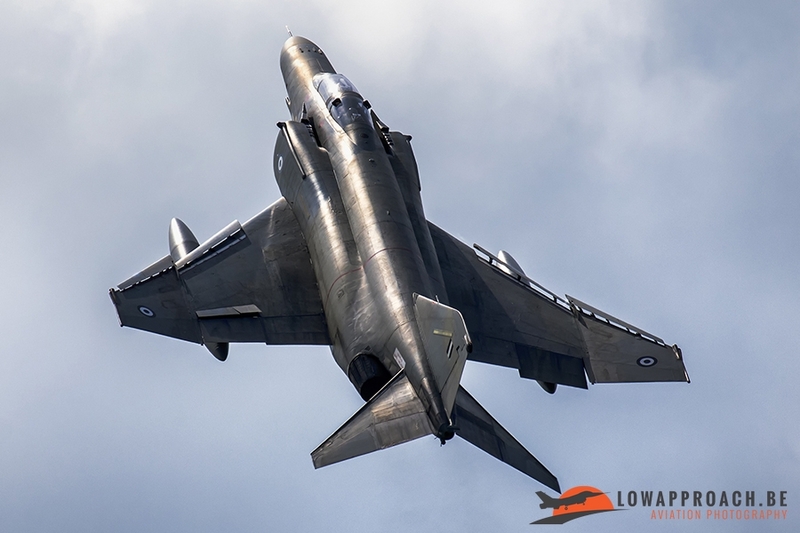 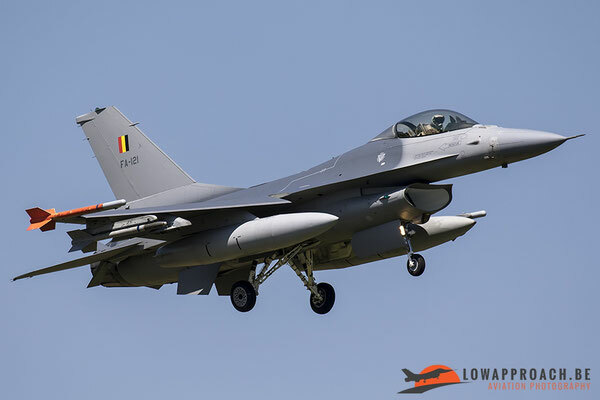 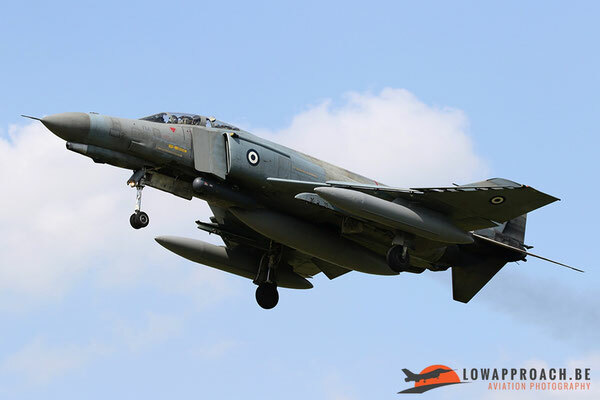 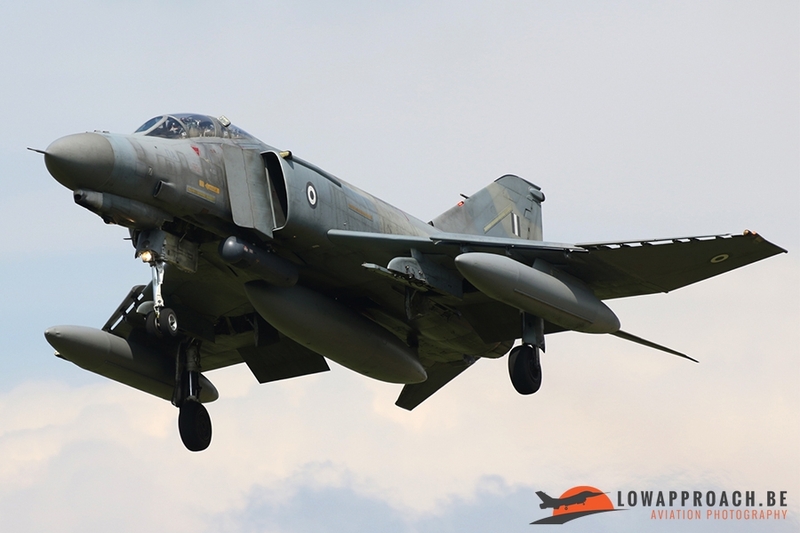 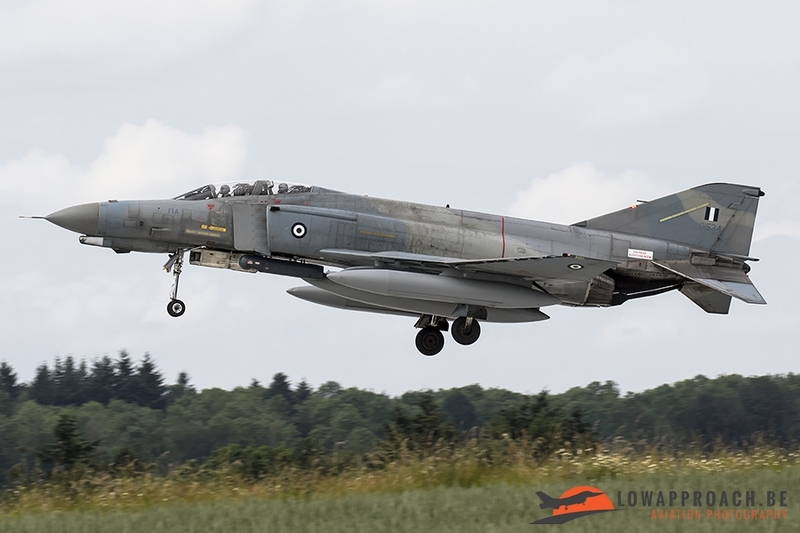 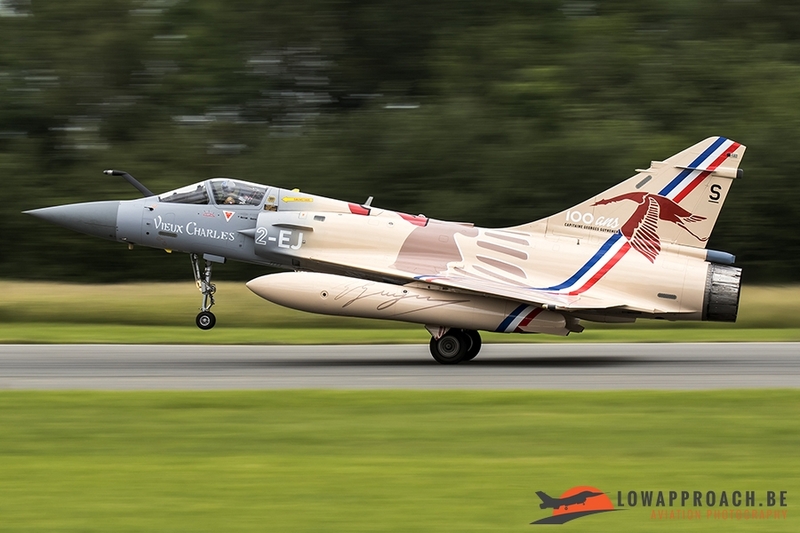 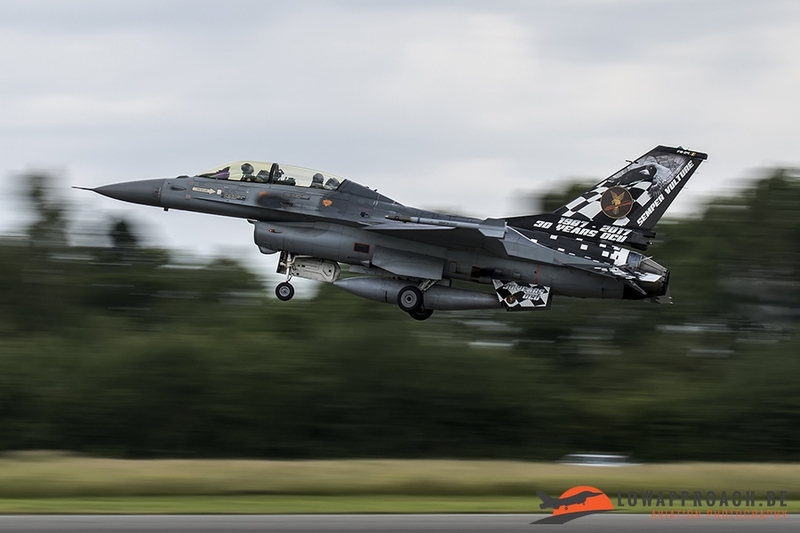 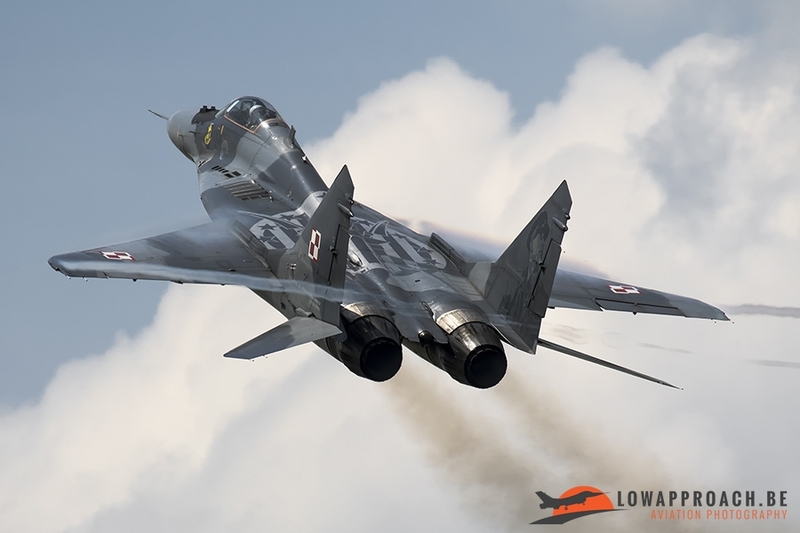 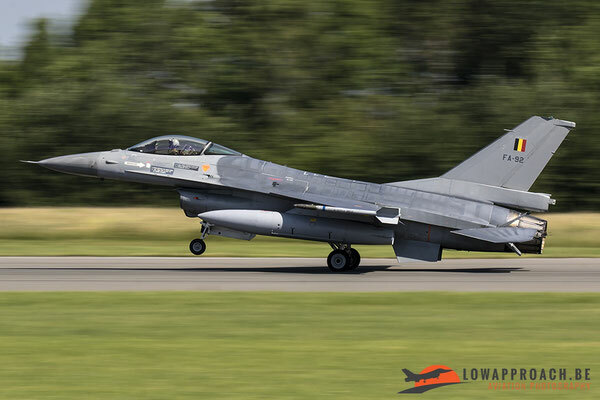 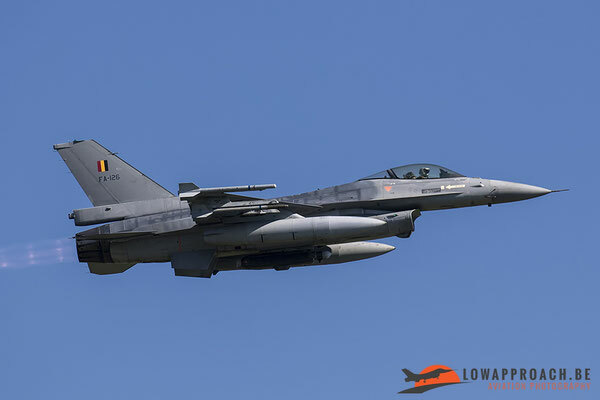 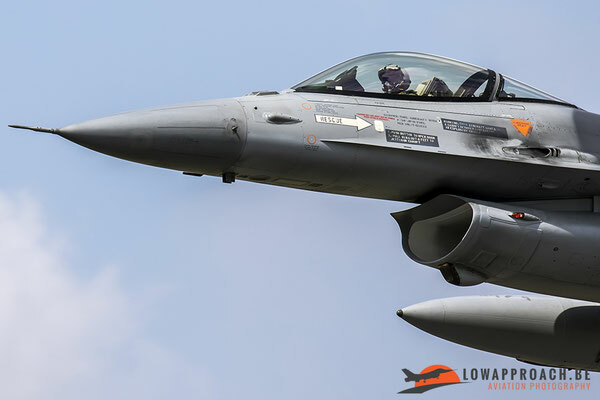 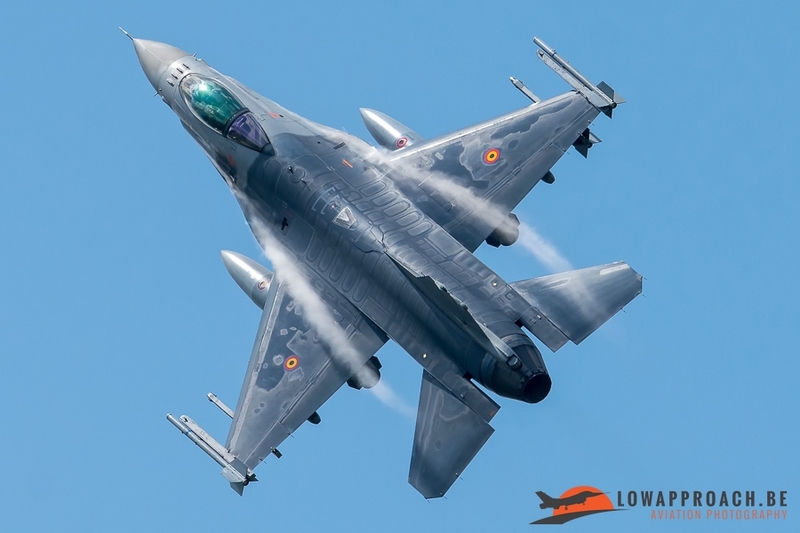 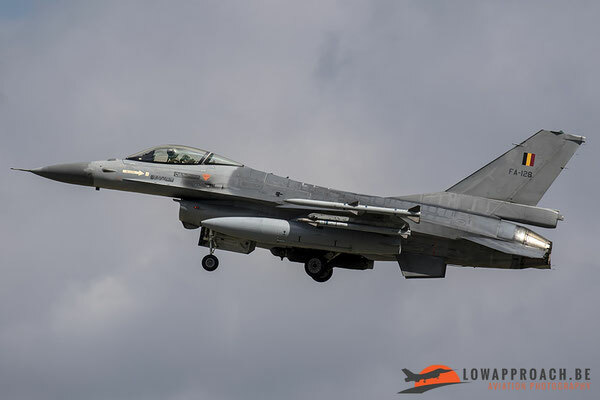 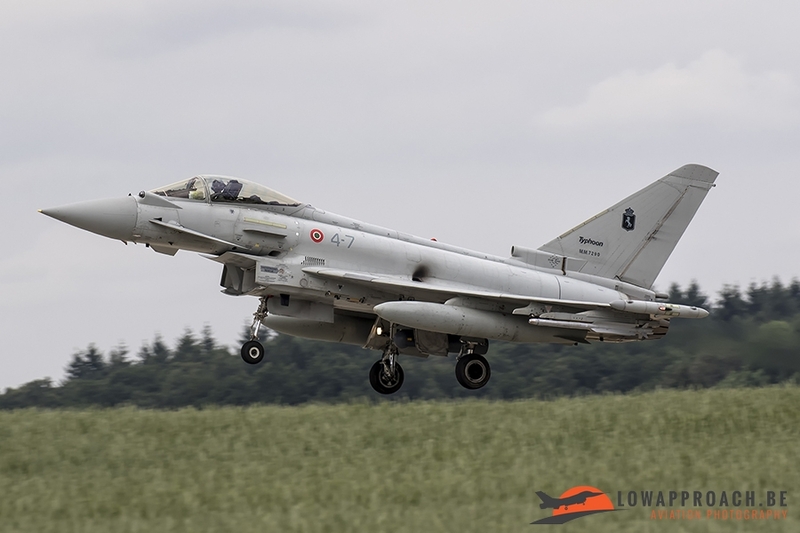 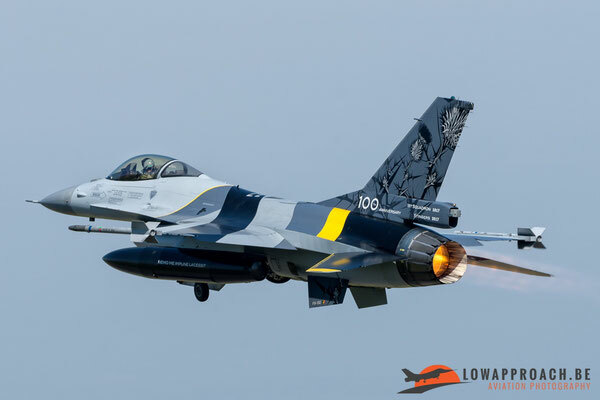 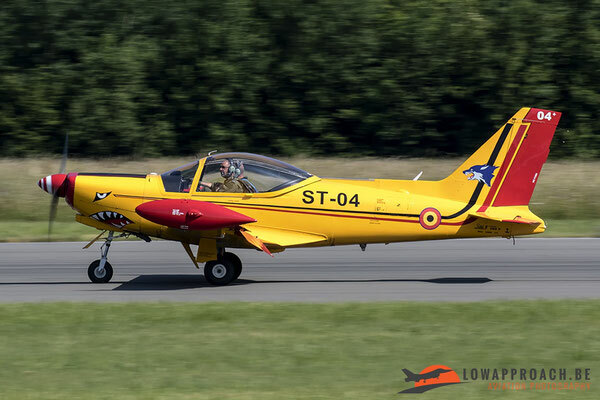 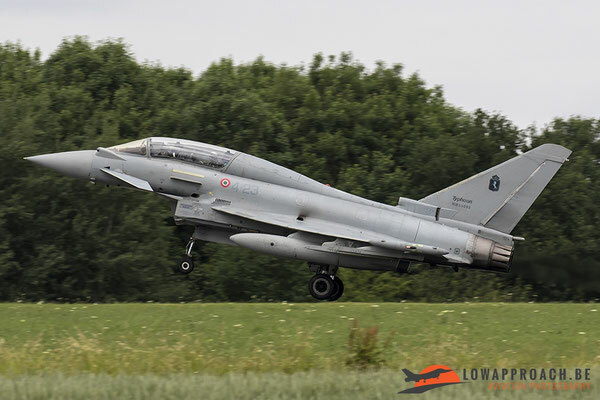 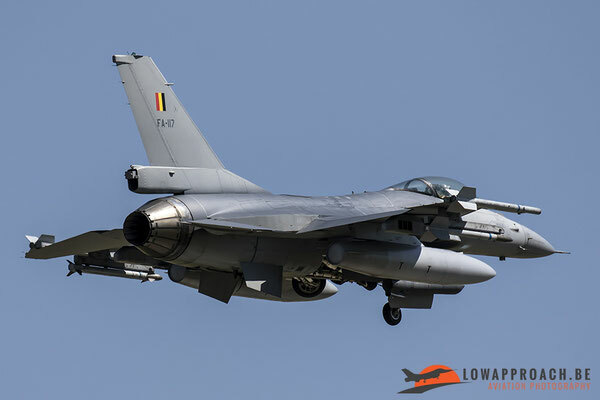 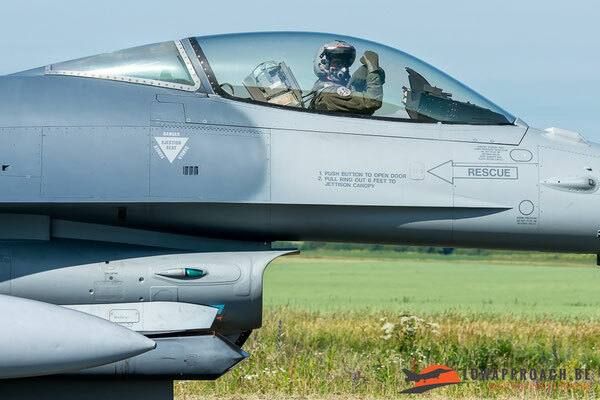 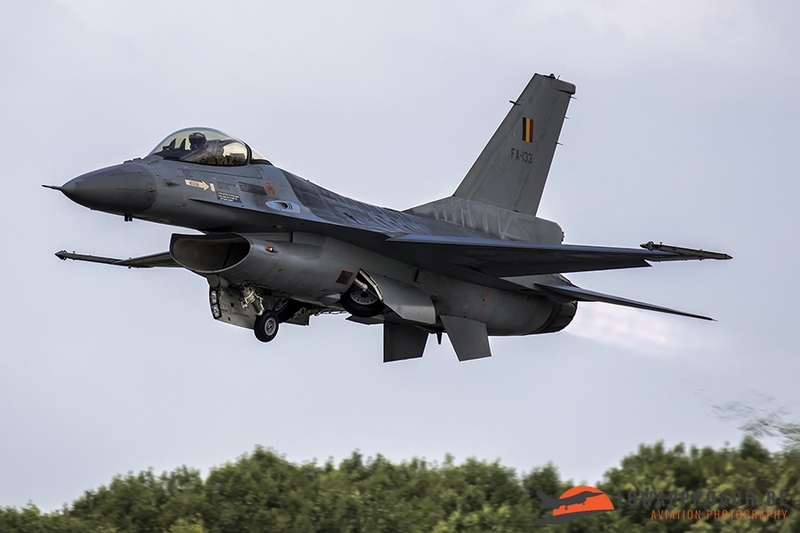 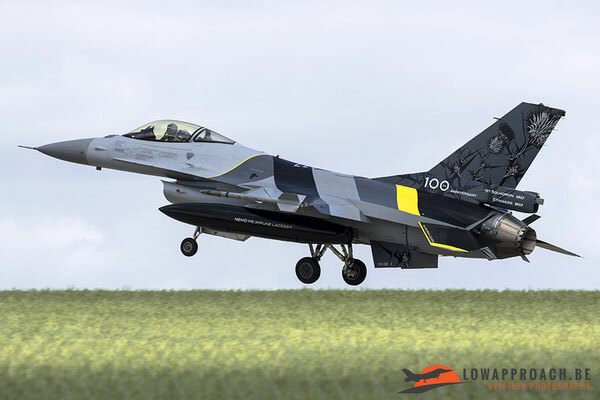 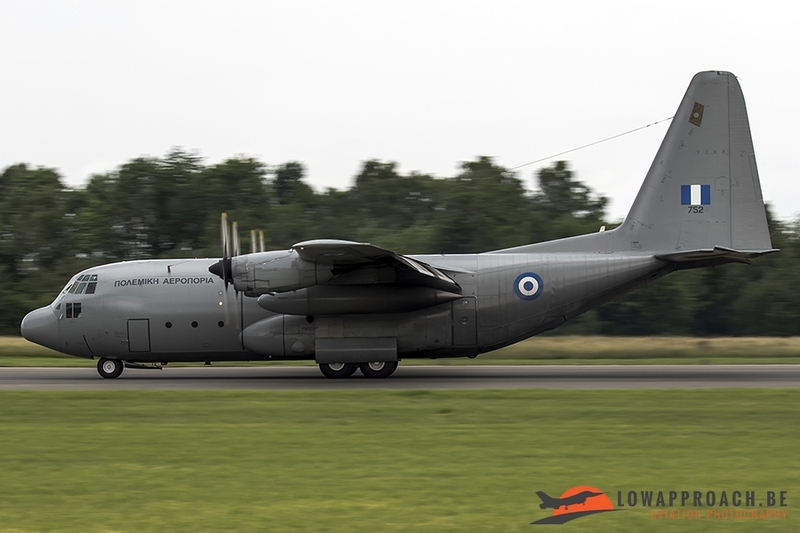 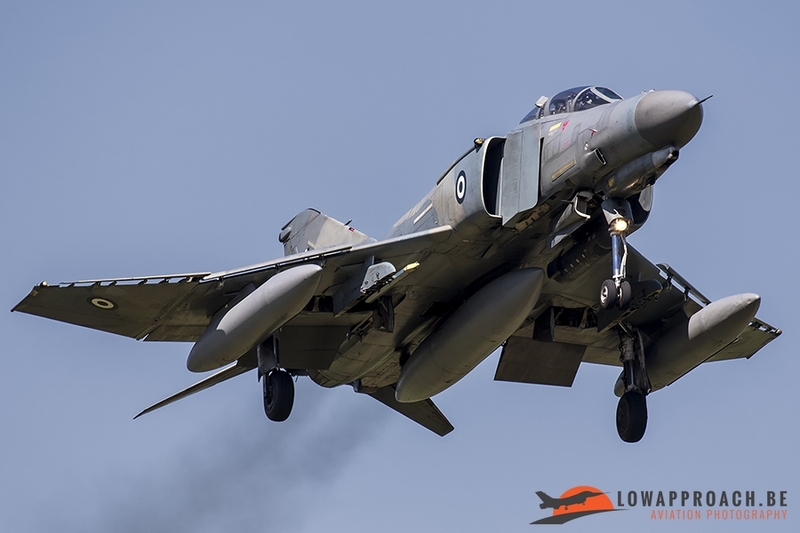 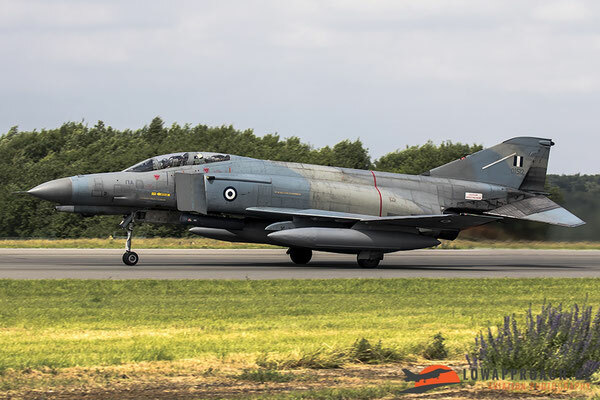 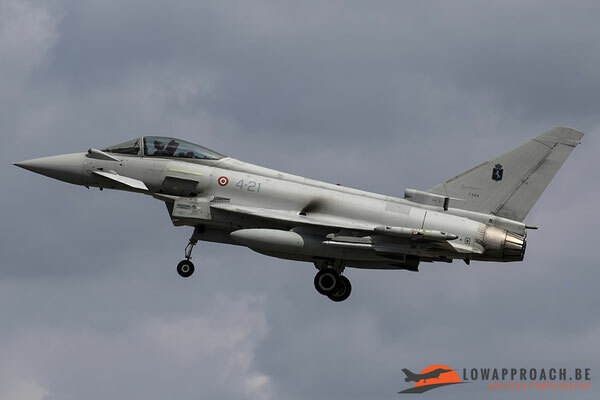 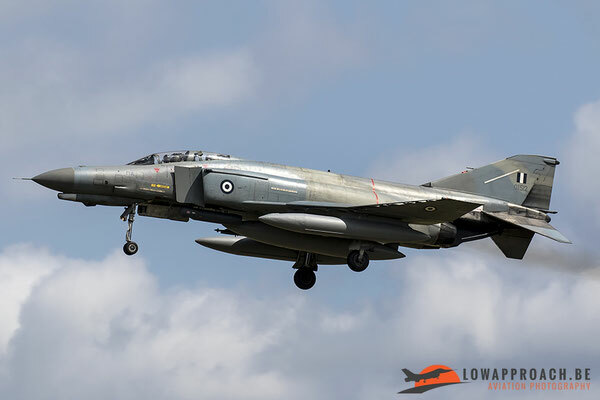 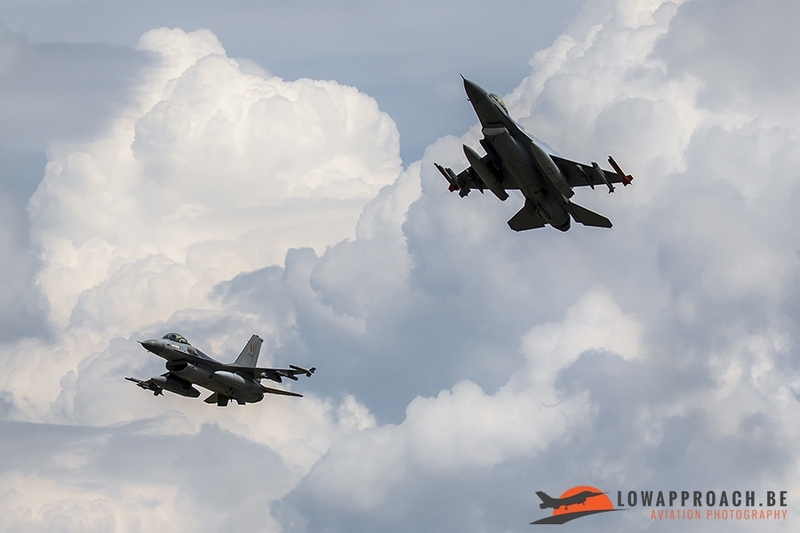 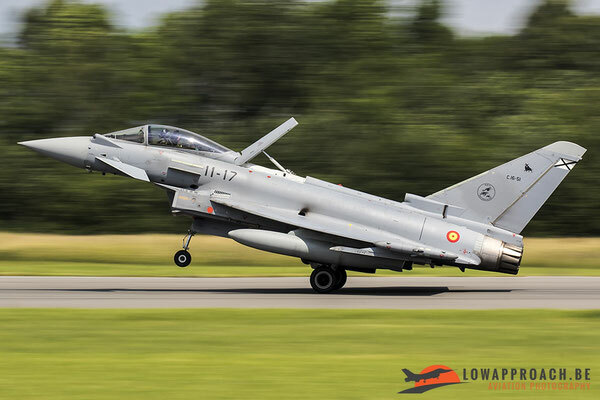 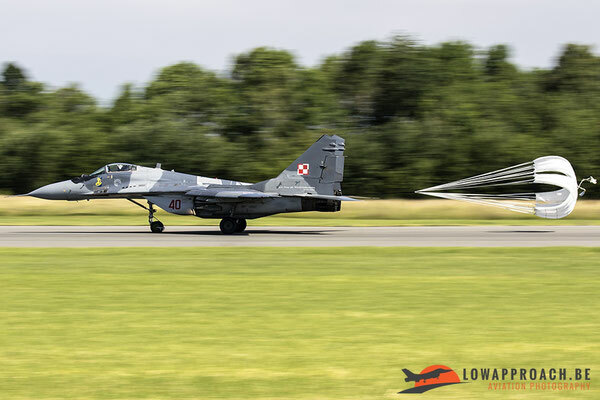 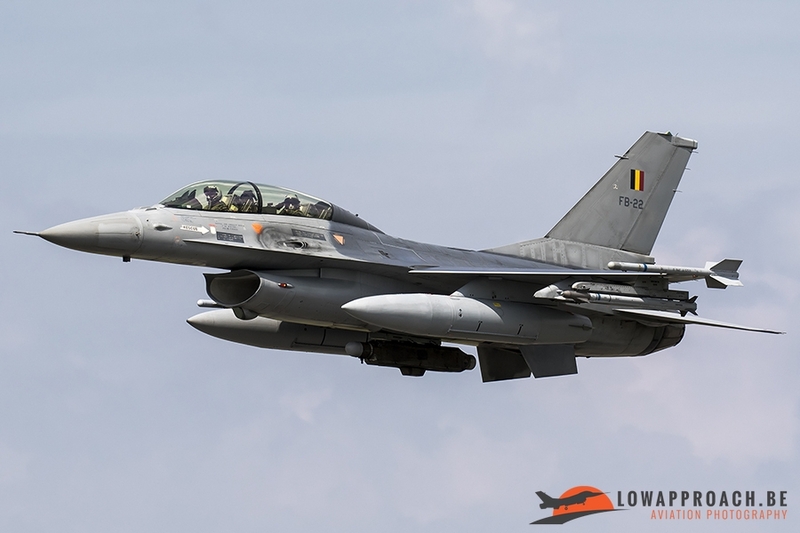 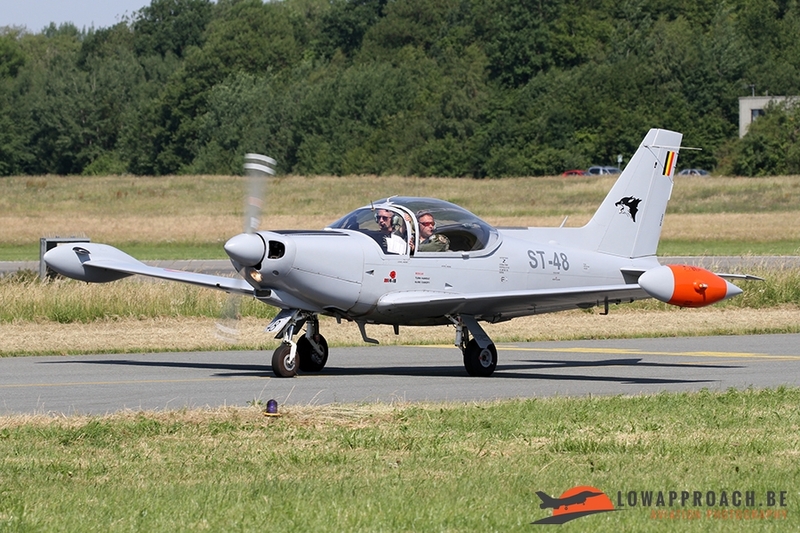 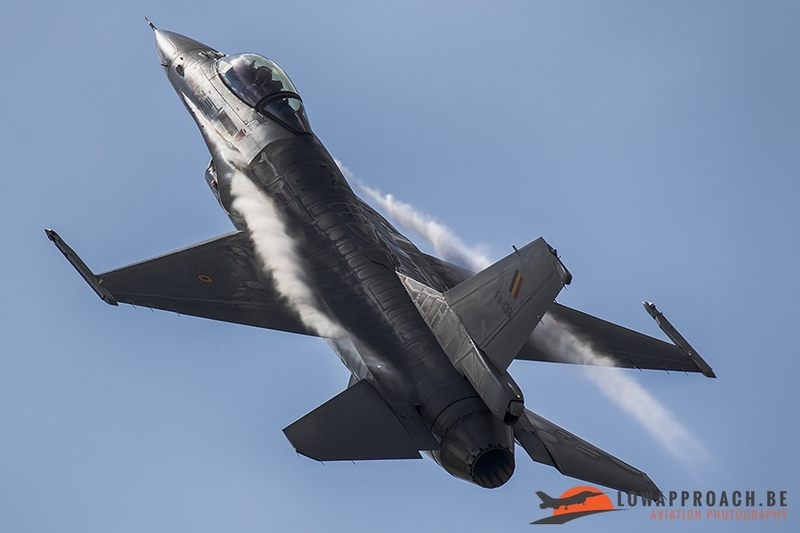 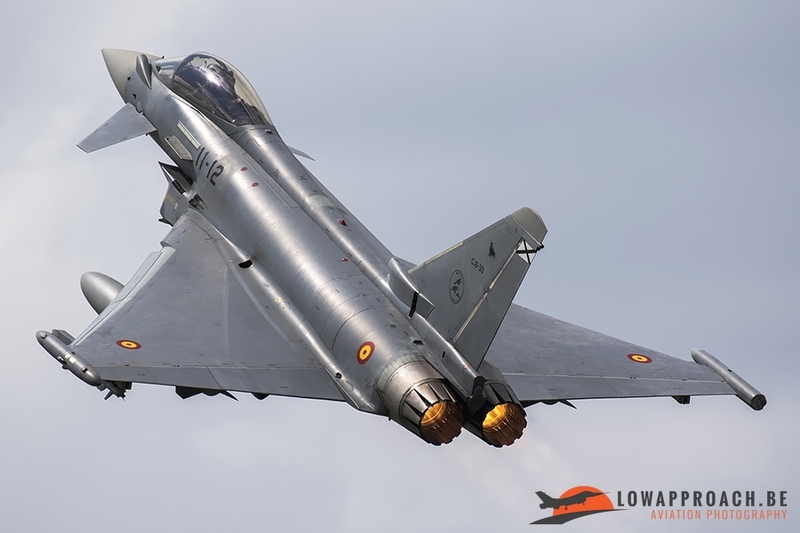 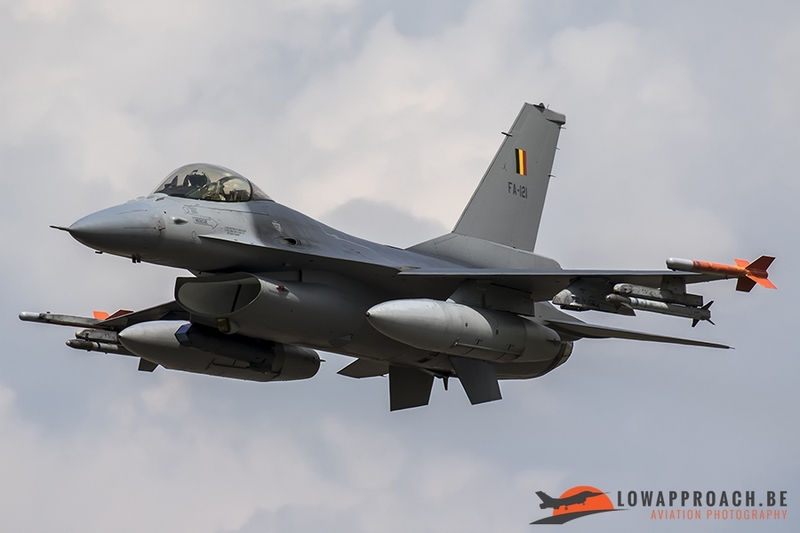 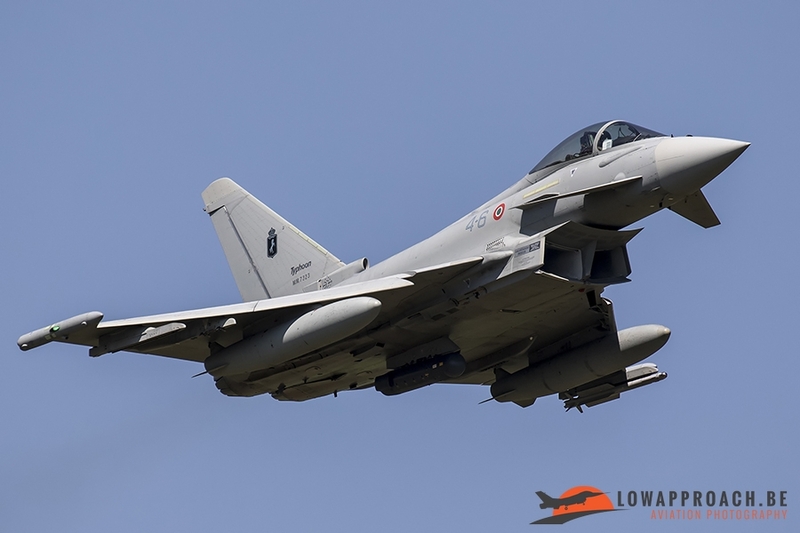 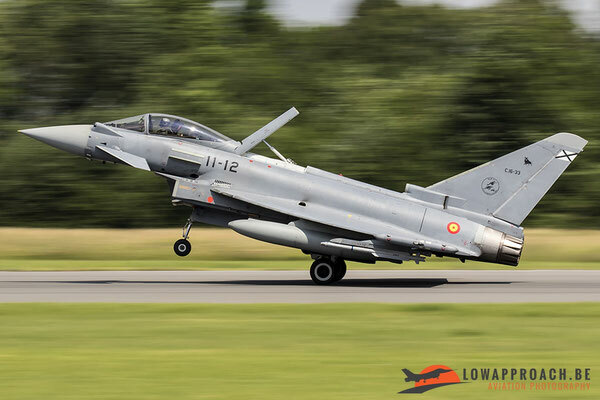 On June 15th other members from Low Approach joined Edwin and Tim at Florennes because the base had organized a spottersday for the aviation enthusiasts. 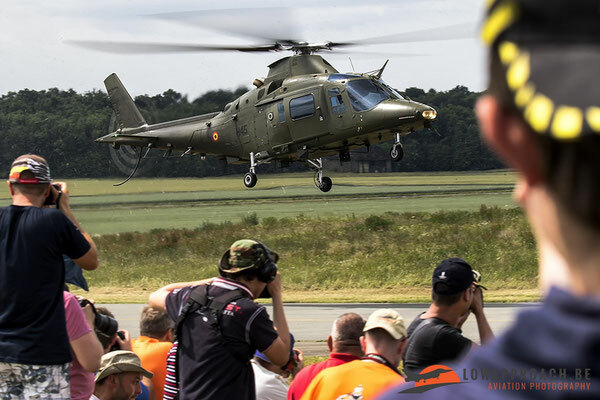 To participate at the spottersday you had the register yourself beforehand because the places were limited. 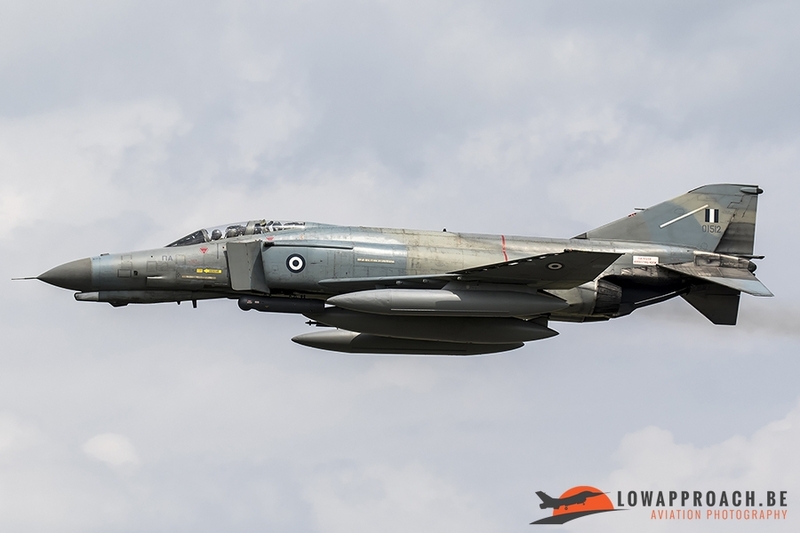 But due to a big amount of interested planespotters the organization was so kind enough to add more places a couple of times so they could please everyone. For the spottersday the organization had marked out an area where the spotters could position themselves. 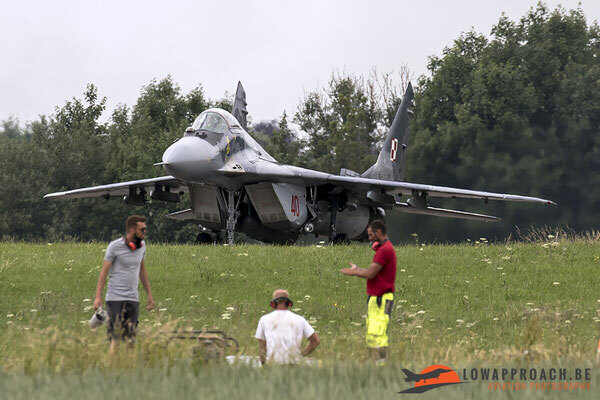 The area that was open for the spotters was situated between the taxiway and the runway. 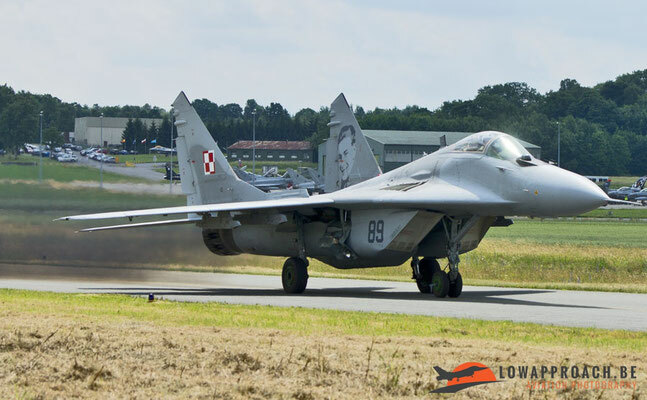 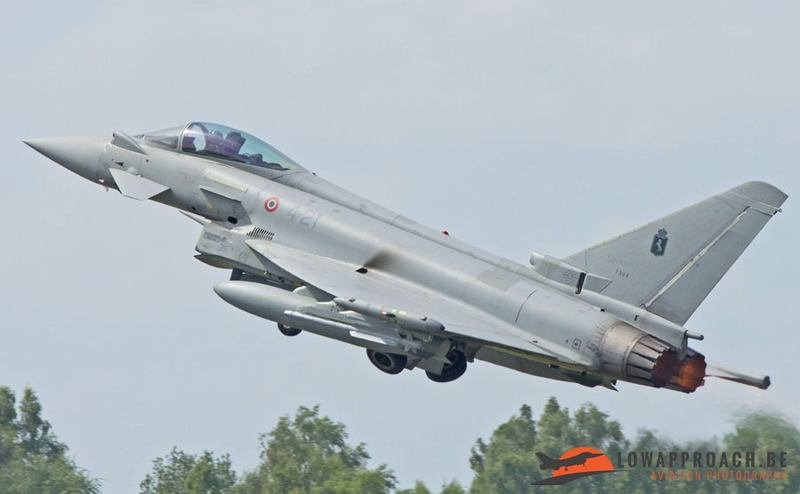 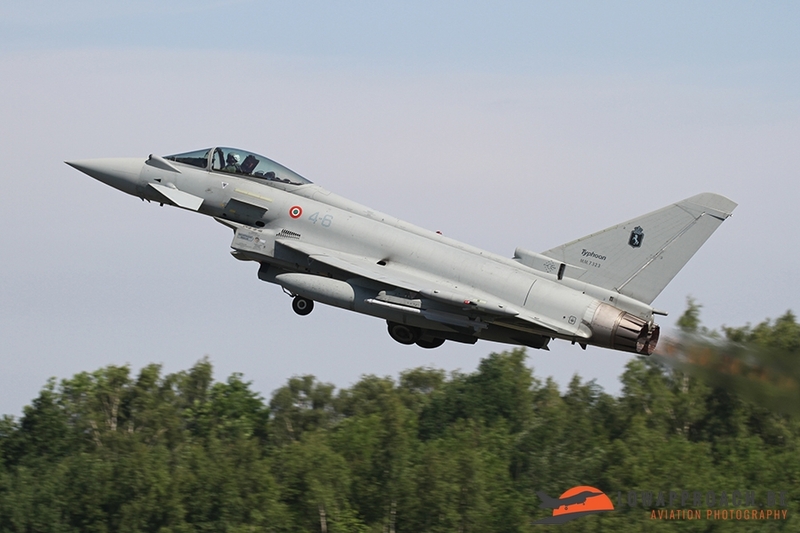 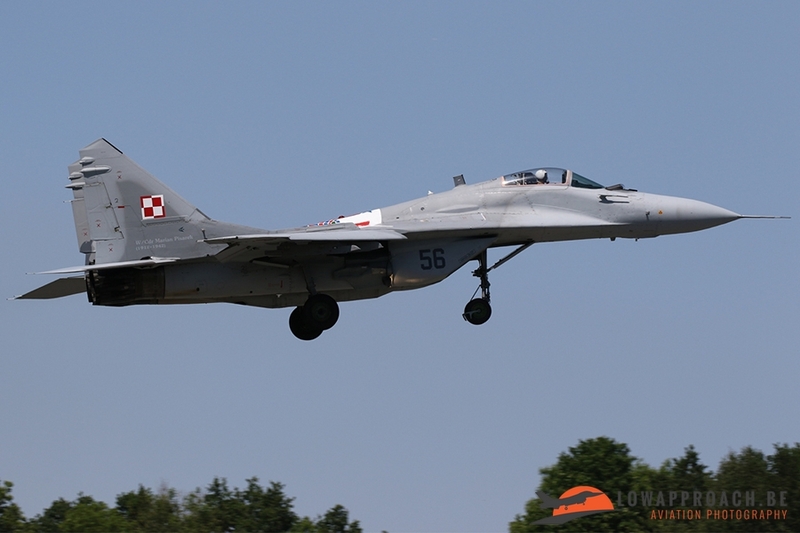 Just like the previous days, the flying activity on the spottersday during the exercise consisted out of 2 waves. 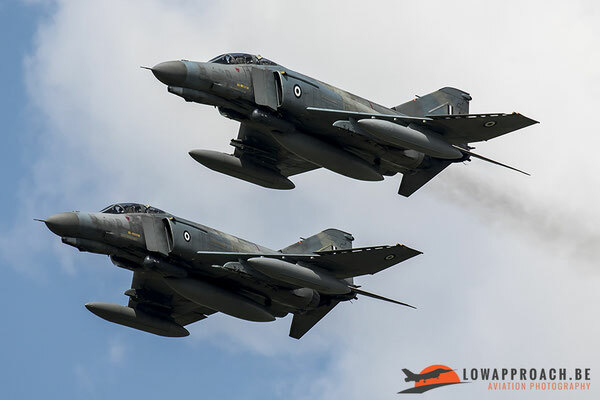 One in the morning and one in the afternoon. Because we were positioned next to the taxiway and the runway the possibilities for making pictures couldn’t have been better. We all were able to photograph the planes whilst they were taxiing towards the active runway and afterwards it was also possible to catch them during their take-off roll. 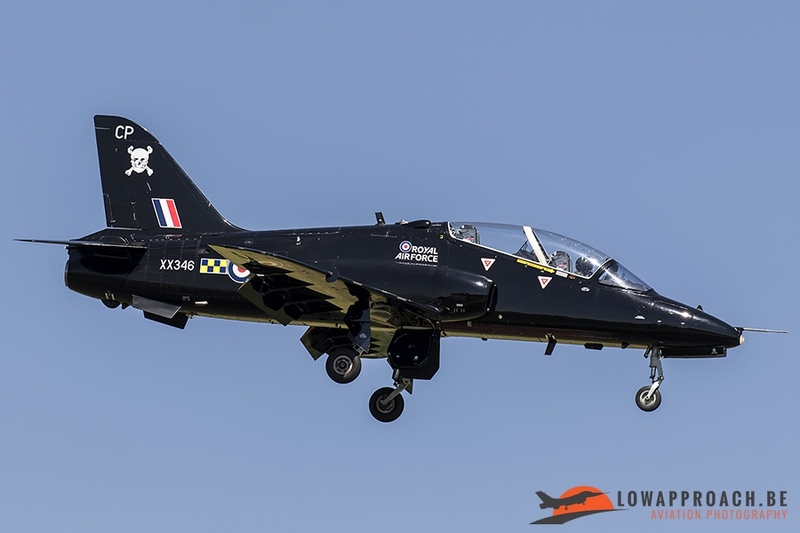 When the aircraft returned after the morning mission as good as all the aircraft made one or more approaches to the great joy of the spotters before eventually landing. 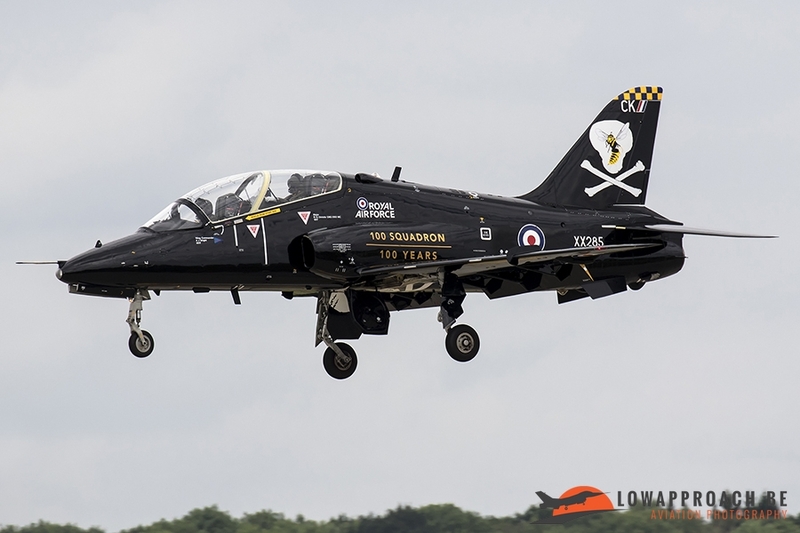 After each aircraft had landed they once again taxied back past the spotters which gave them again another chance to make the pictures they wanted. After the last aircraft from the morning mission had landed, we thought we had enough time to visit the couple of sale stands and buy some food before the wave from the afternoon mission began to start up. 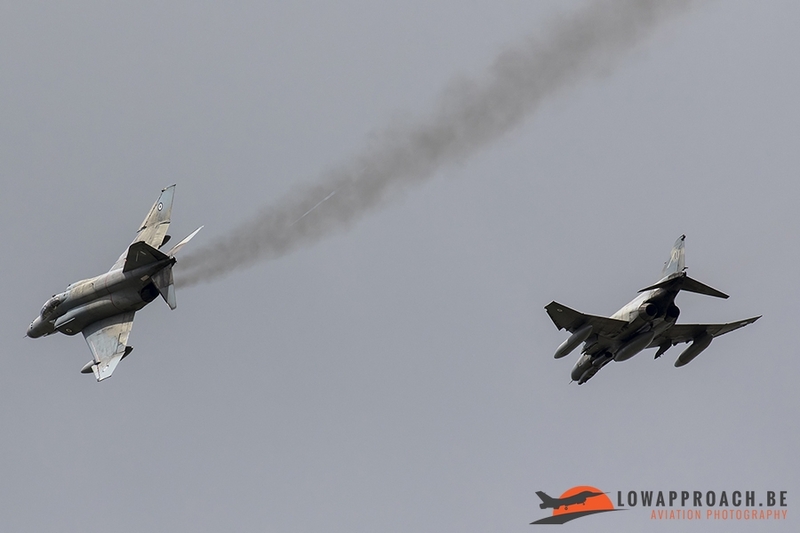 But we couldn’t have been more wrong because between the 2 waves, to our surprise, a lot of visiting planes showed up and they also performed some really impressive passes before landing. 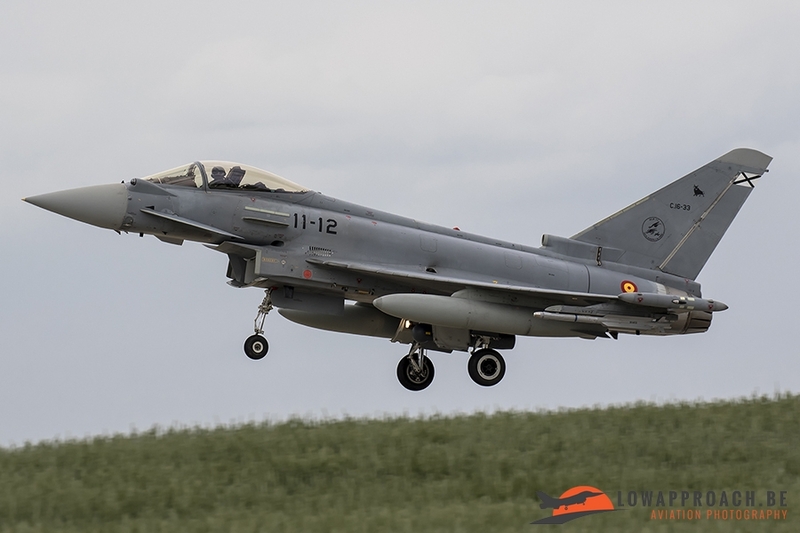 Because the spottersday was also the last day from the exercise and the 1st squadron had planned a party to celebrate their centenary after the afternoonwave, they had invited other squadrons to join the party. 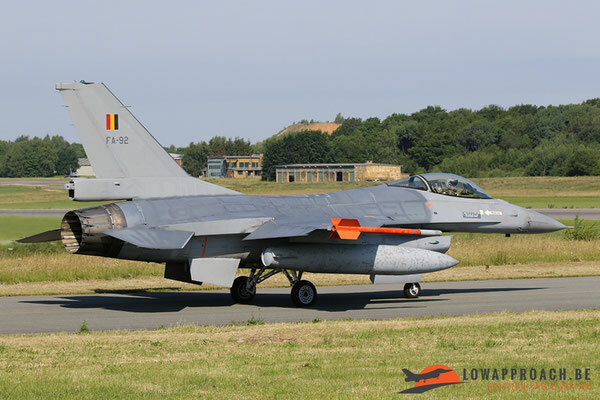 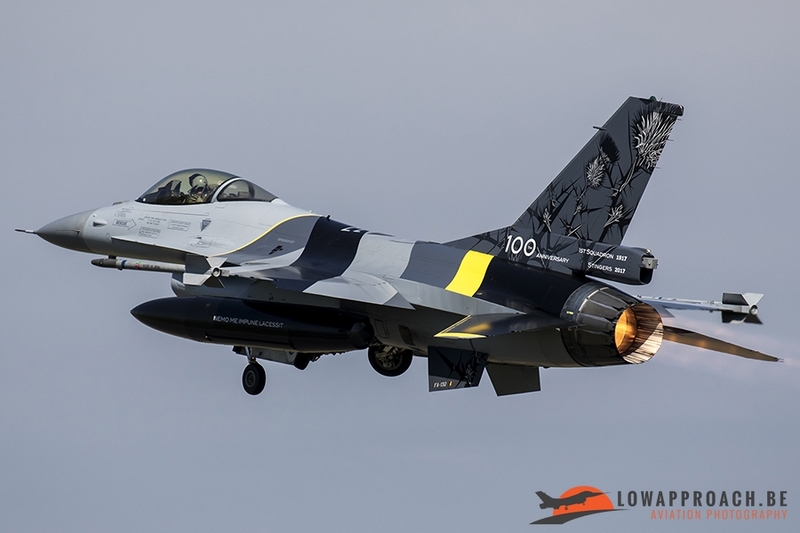 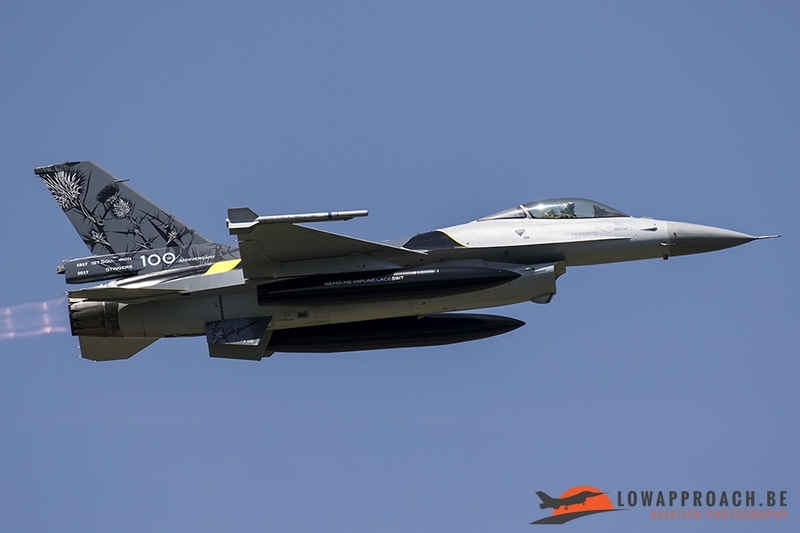 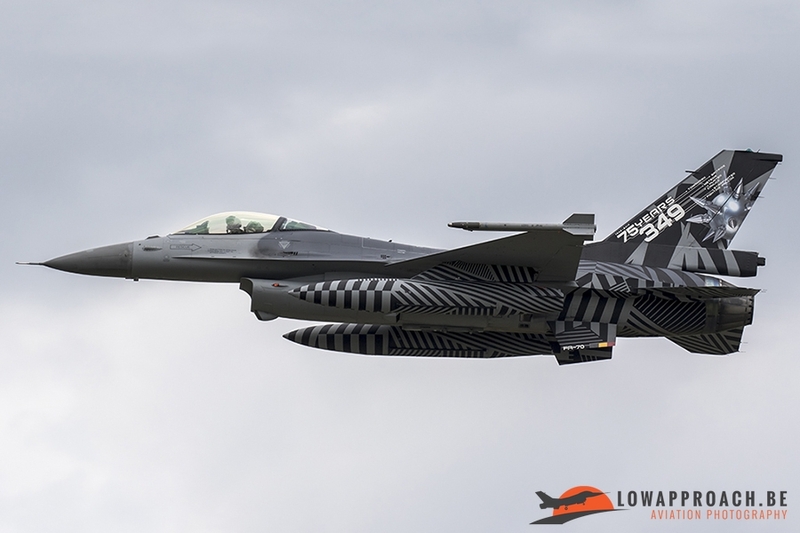 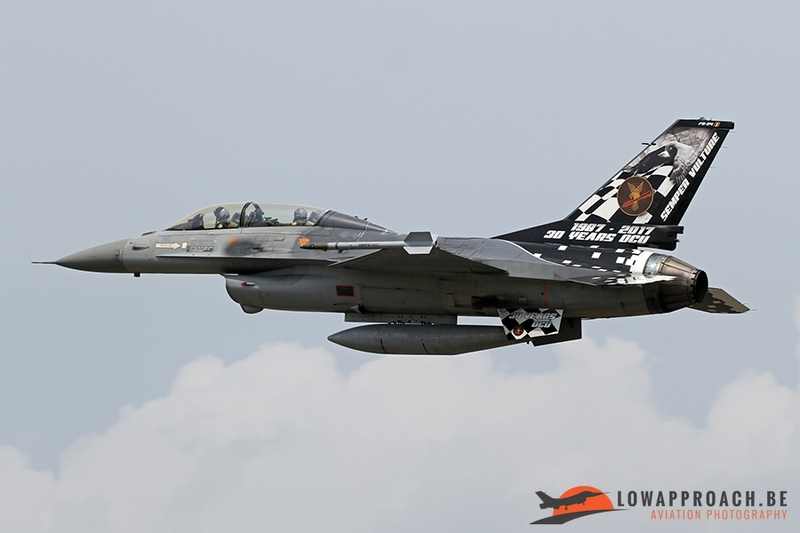 From Kleine Brogel came 3 F-16’s, two of them wearing a special paint scheme. 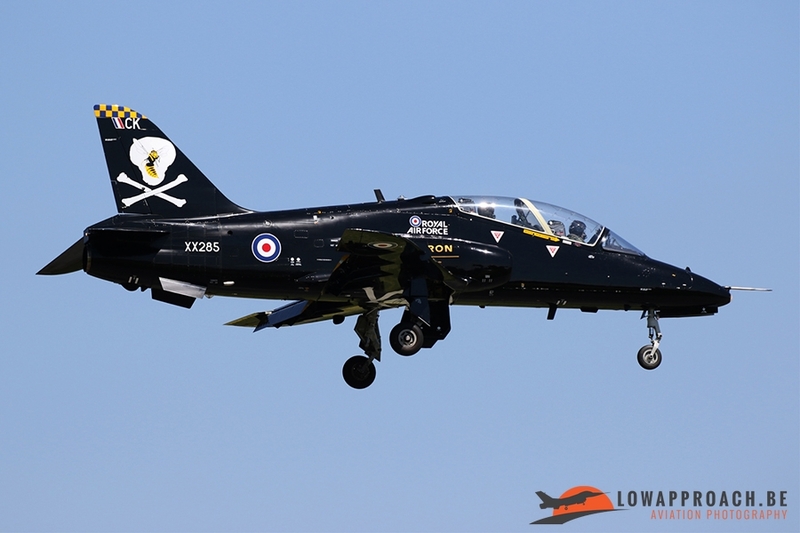 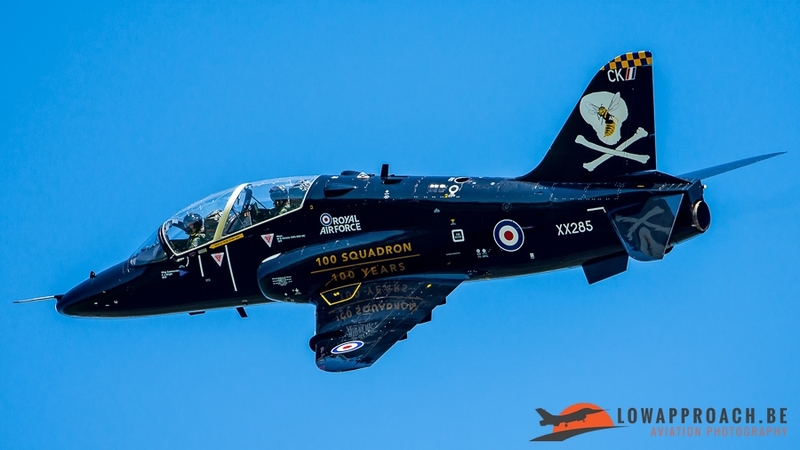 One being the paint scheme from 349 squadron to celebrate their 75th anniversary, the other one was the one from the OCU who were celebrating their 30th anniversary. 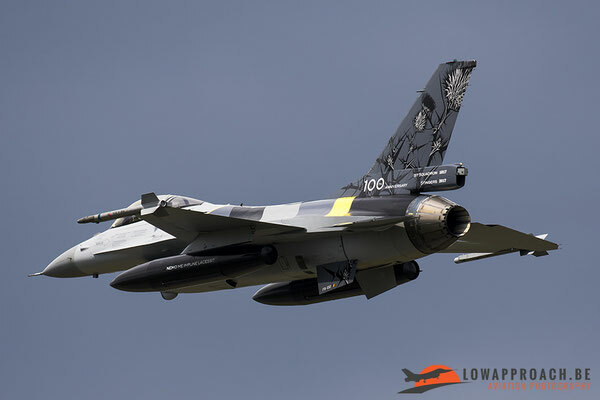 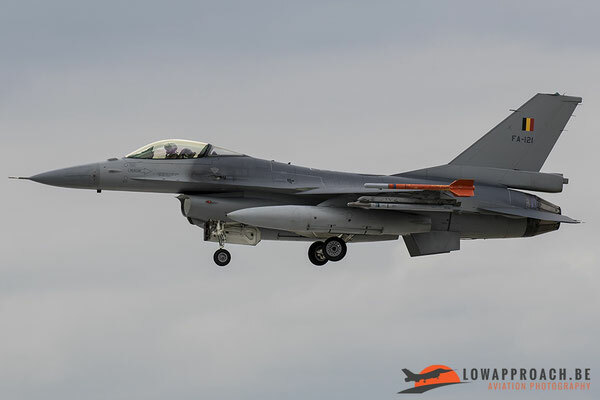 Although the third Kleine Brogel F-16 didn’t have a special paint scheme, this one could also be seen as a special one as it was the FA-56, the oldest, still operational F-16 in the fleet. 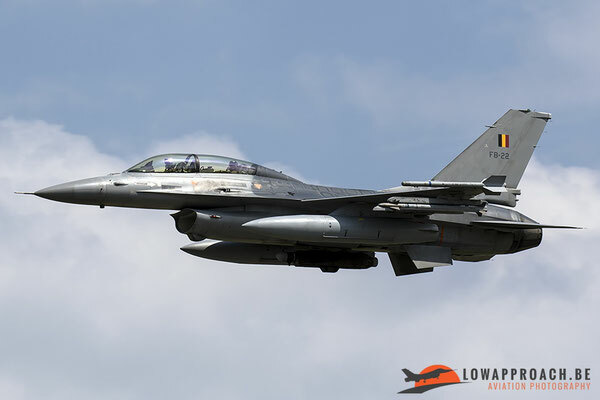 Not only aircraft from Kleine Brogel visited Florennes but also from Beauvechain a couple of pilots came over. 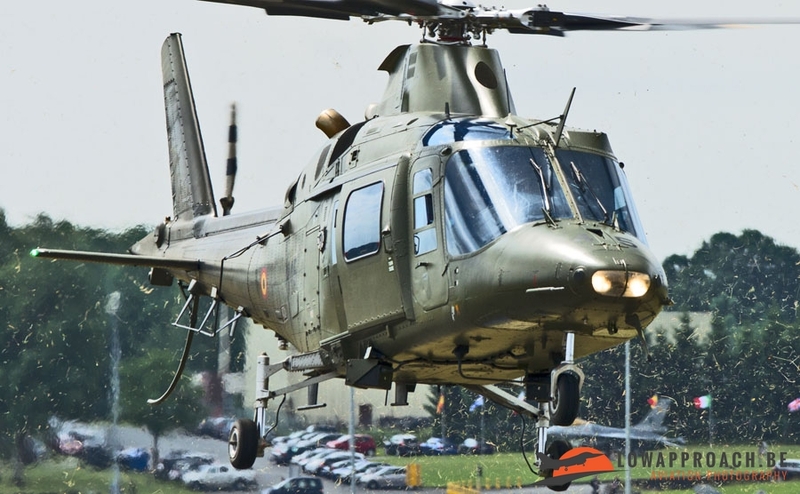 2 SF-260’s, one in the old yellow paint scheme and one in the new grey paint scheme landed and also an A109 paid a visit although this one left a little while later. 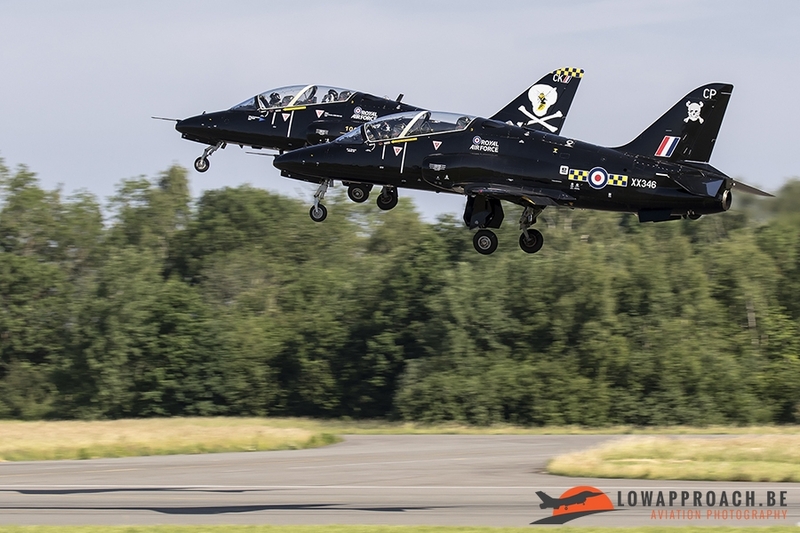 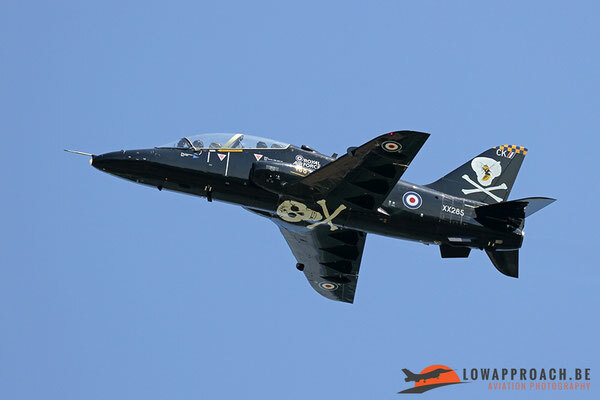 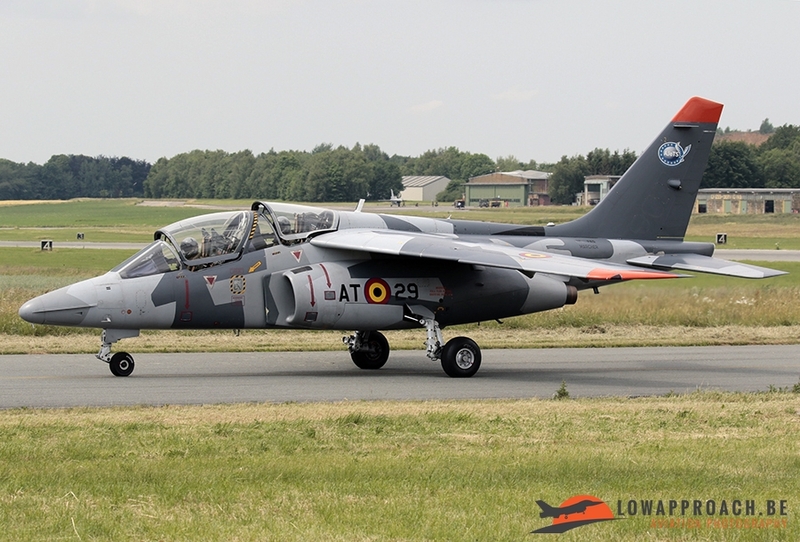 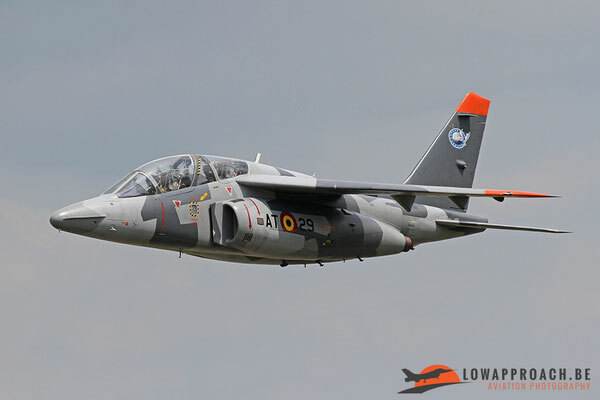 A last Belgian aircraft that came to Florennes was an Alpha Jet 1B+, still wearing the special paint scheme from 2014, although the sticker on the tail was missing. 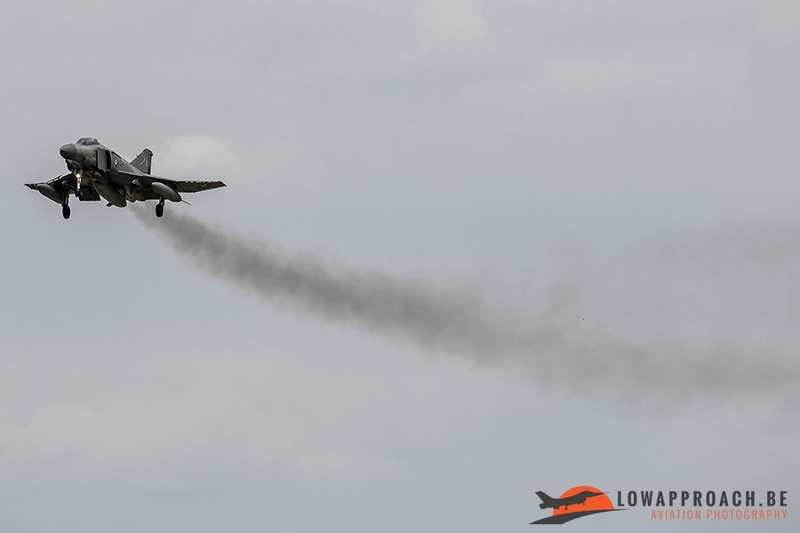 The pilot from this jet trainer made some really impressive passes before putting his plane down. 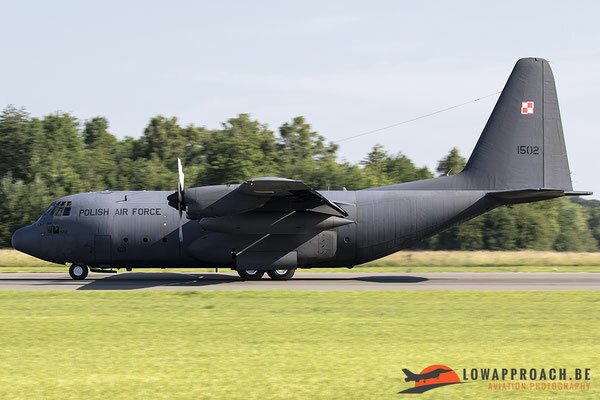 Besides the Belgian aircraft we were very lucky to also see other international visitors. 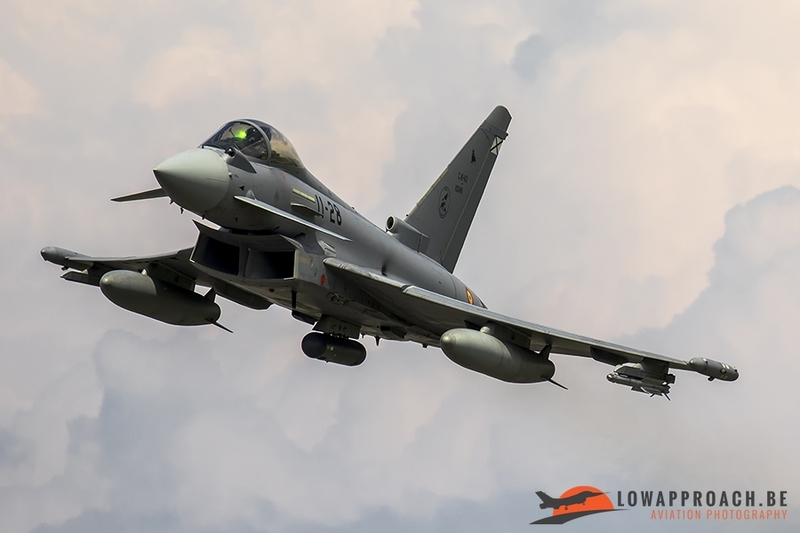 Out of the blue, and to the big surprise of many spotters was a single and rather high fly-by from 2 EF-2000’s from Germany. 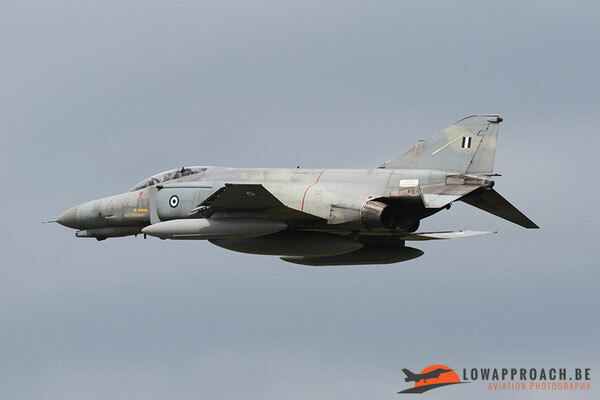 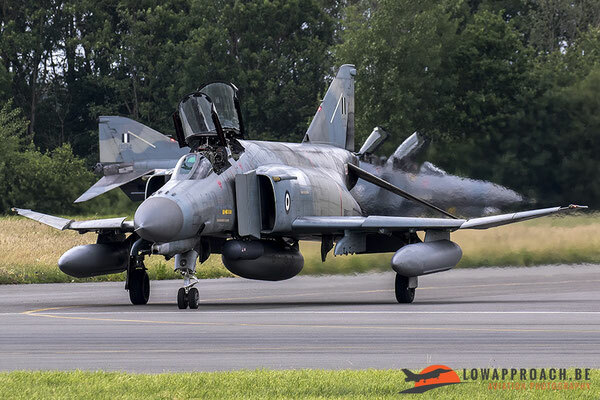 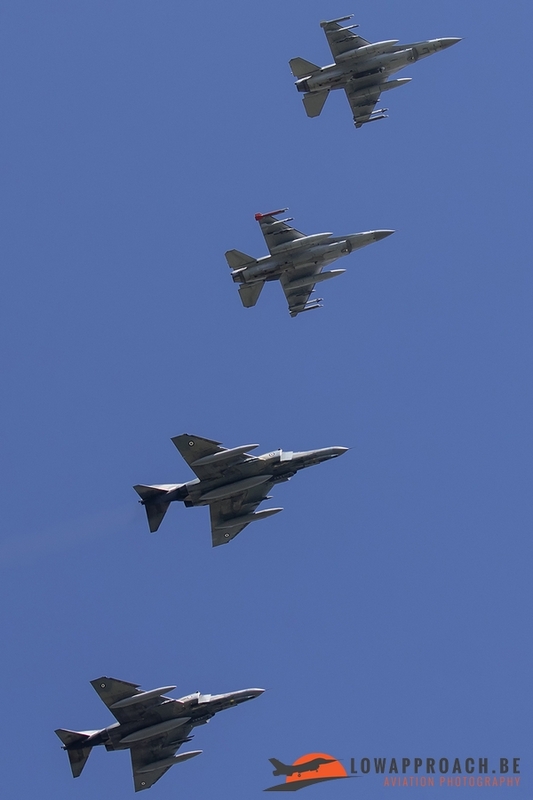 One of these 2 also had a special painted tail and therefore it could be identified that they came from Wittmund. 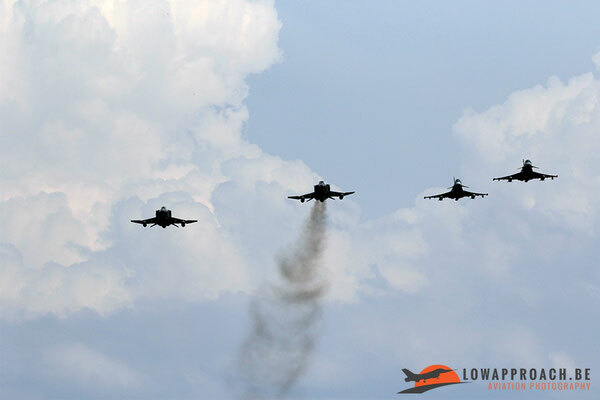 Due to the surprise and rather cloudy weather during their fly-by none of our team managed to capture them sadly. 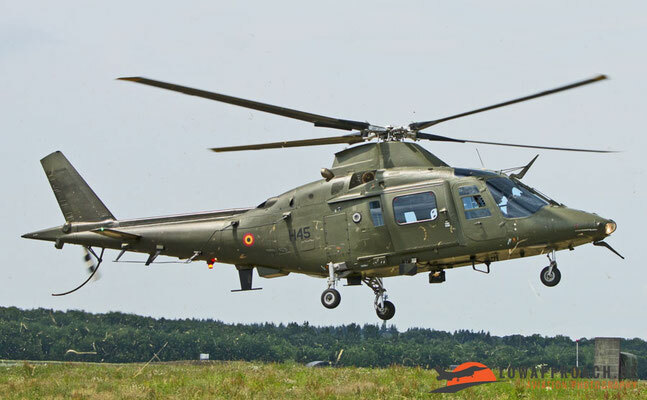 One of the foreign squadrons that visited Florennes was from Escadron de Chasse 01.002 'Cicognes', based at Luxeuil-Saint Sauveur. 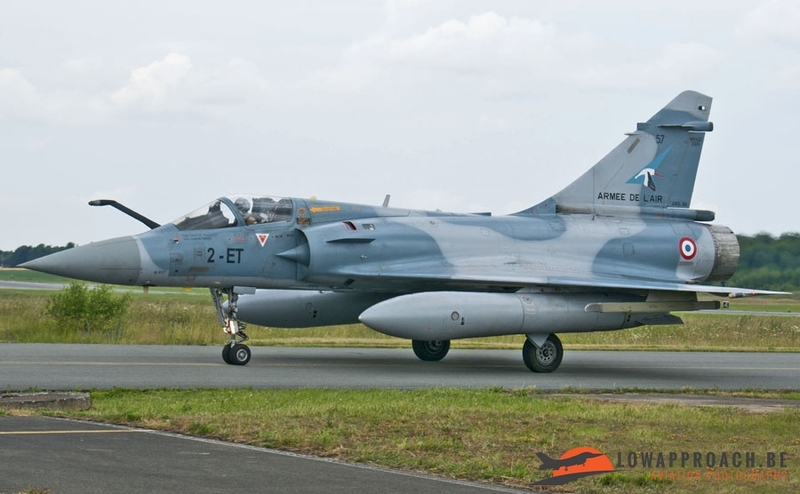 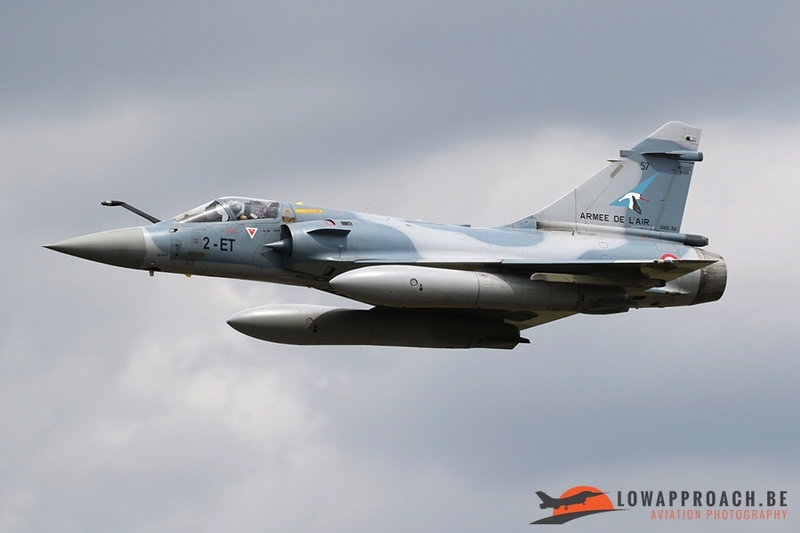 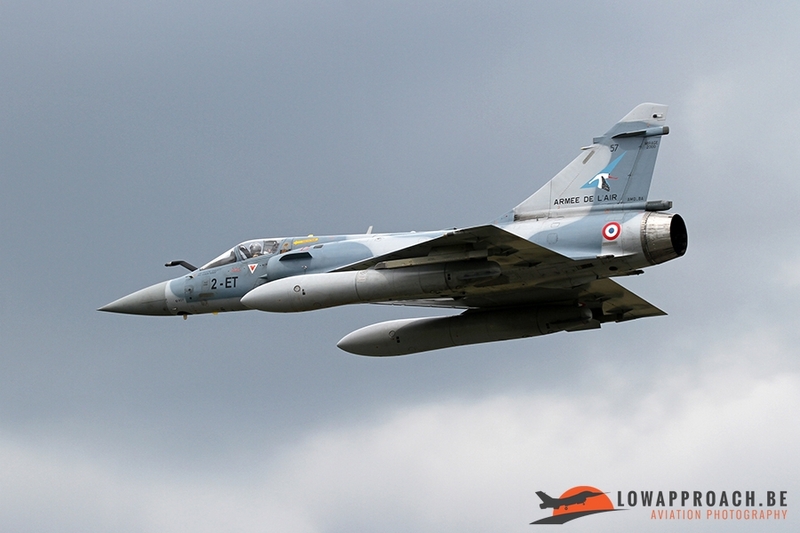 They came with 2 Mirage 2000-5F’s one of which was wearing the special scheme to commerate Capitaine Georges Guynemer. 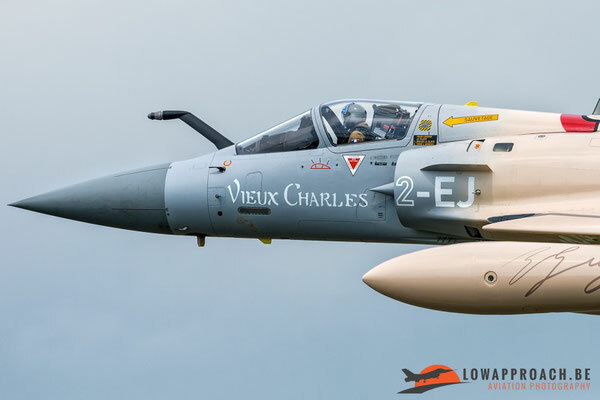 He was a French fighter pilot during WWI which managed to shoot down 53 enemy planes before he was eventually shot down in 1917 and was killed. 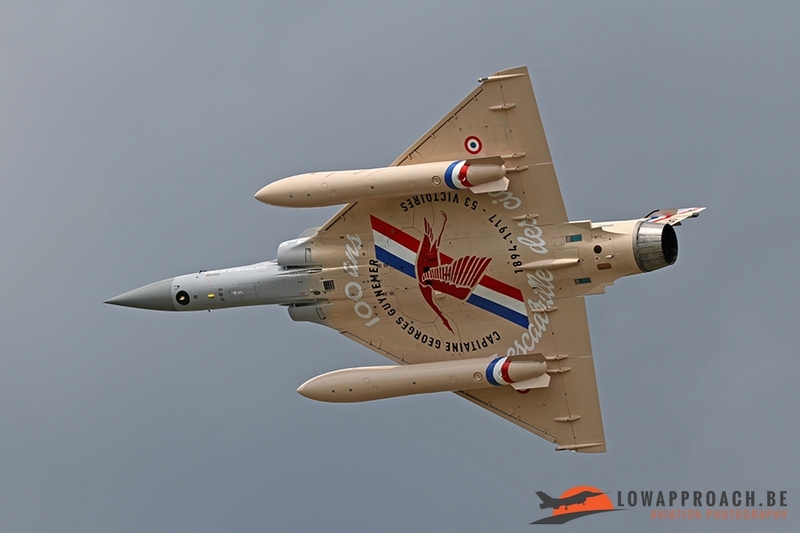 One of the escadrilles forming EC 01.002 is SPA3 'Cicogne de Guynemer', which was Guynemers personal emblem. 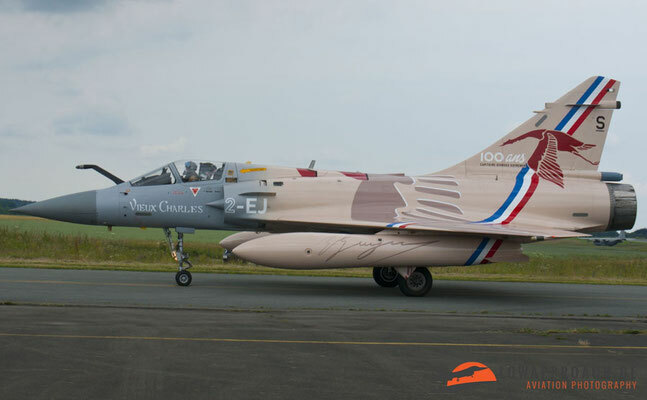 The paint scheme of the Mirage 2000-5F, called 'Vieux Charles', looks back at the paint schemes worn by Guynemers own aircraft during WWI. 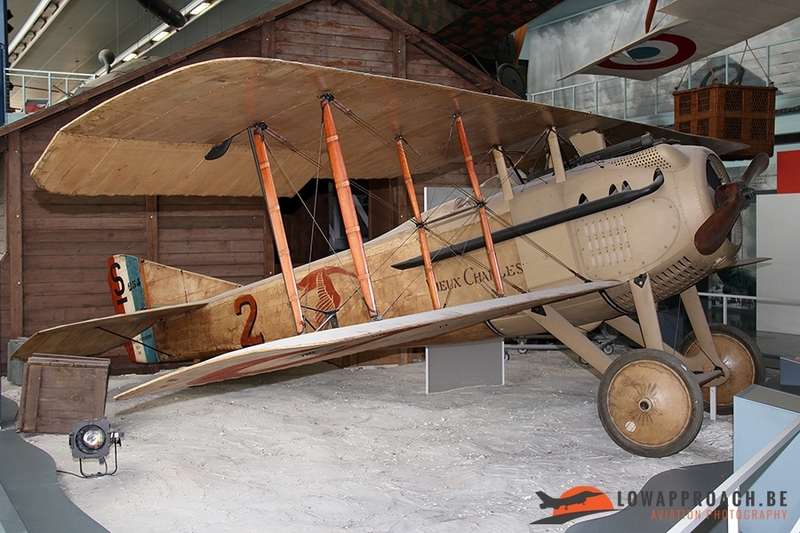 One of Guynemers original aircraft, a Spad VII, is still preserved in the museum at Le Bourget. 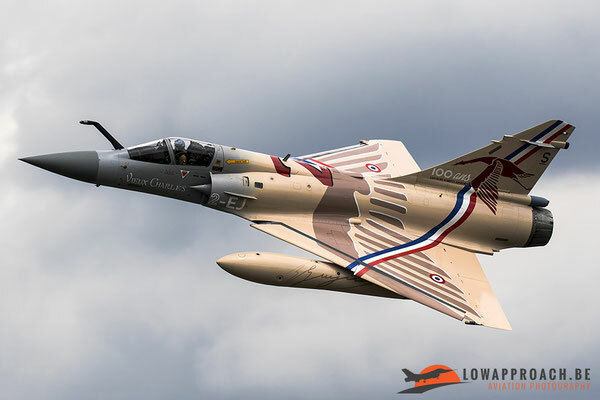 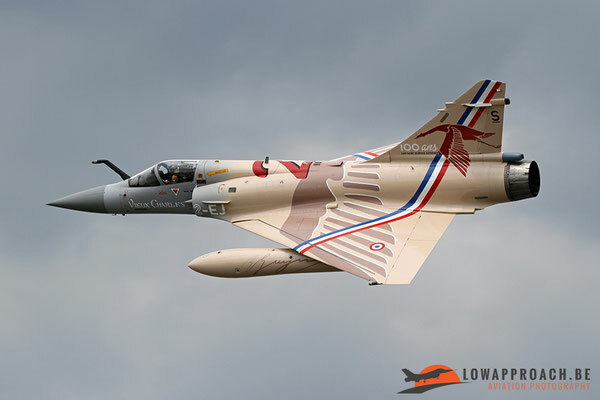 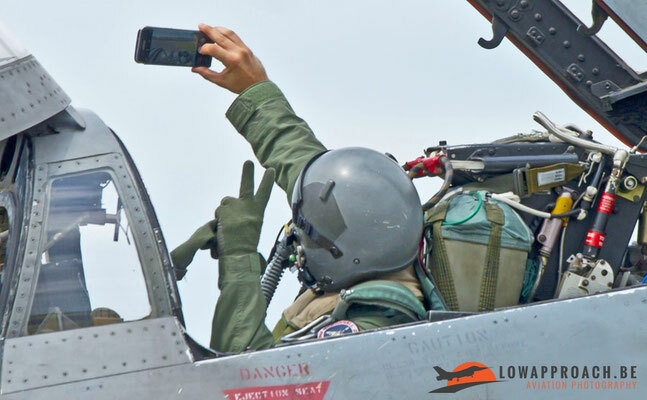 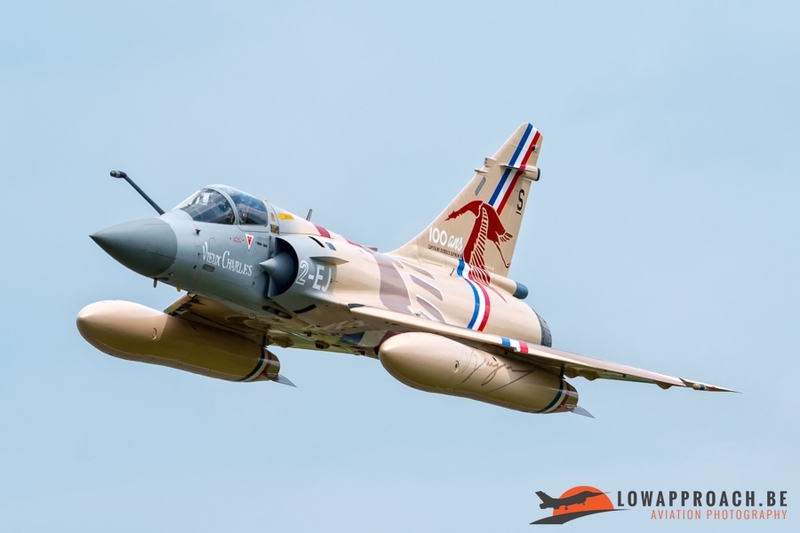 The pilot that flew with the special painted Mirage really knew how to show off this paint scheme because he made some really beautiful passes enabling the spotters to capture both the bottom and the upper side of the paint. After these beautiful delta’s had landed the second wave from planes that participated at the TWM were slowly starting up. 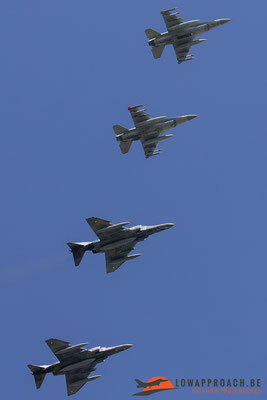 This time they took off more separate in contrast to the morning mission. 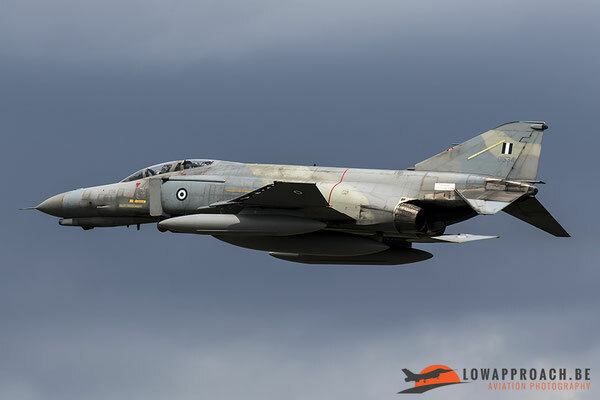 But this meant that the spotters also didn’t had to wait long because there was pretty much constant action, being it from taxiing planes to planes that were taking off, to planes that were making some incredible approaches before landing. For a lot of military spotters the passes that were made in the afternoon beat any airshow, especially the passes that the 2 Spanish C.16 Typhoons were making. 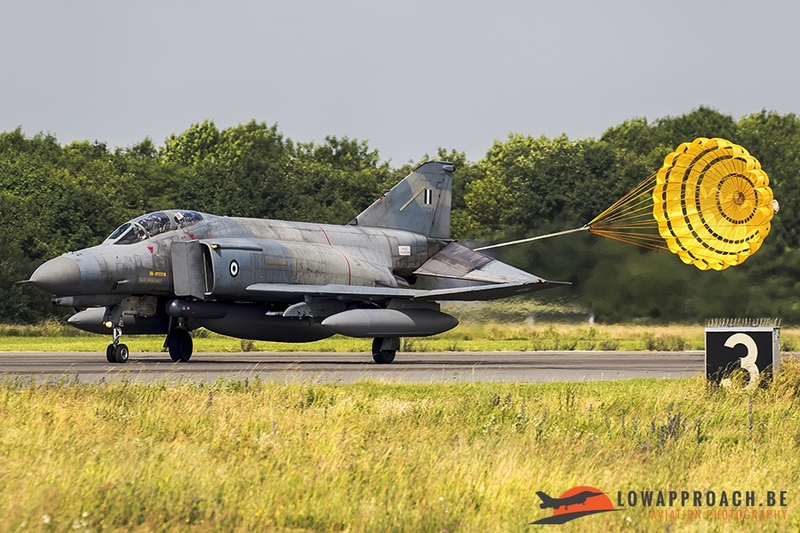 But not only the most modern participating planes knew how to impress the aviation enthusiasts, also the oldest ones in the group knew how to make the spotters happy. 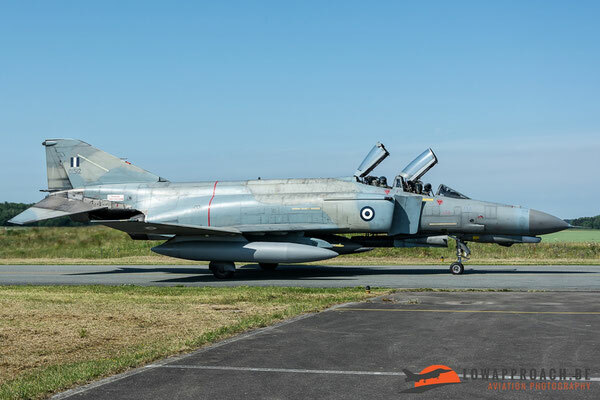 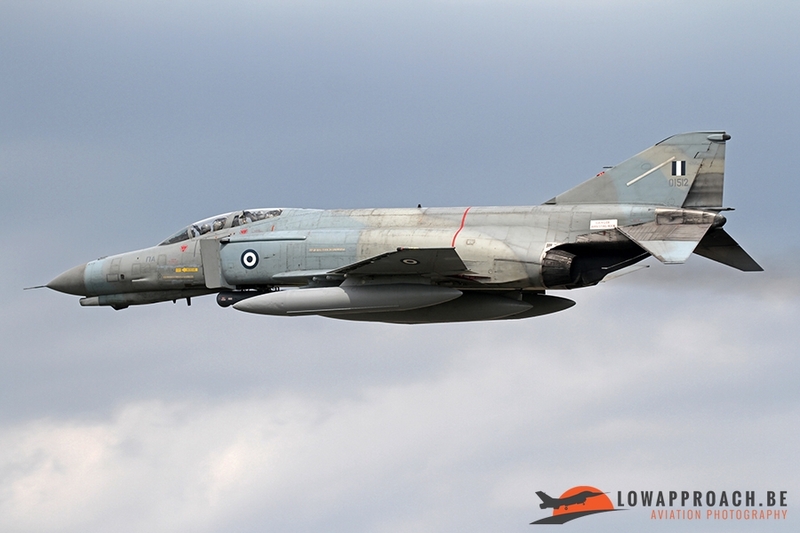 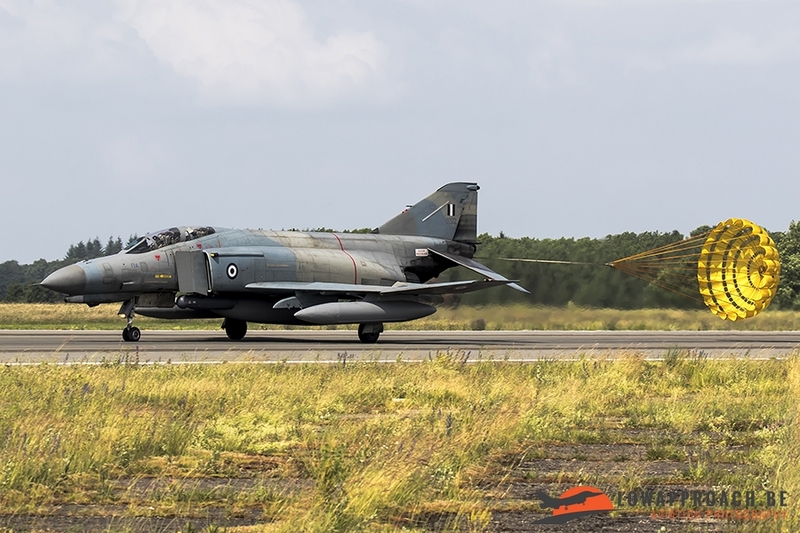 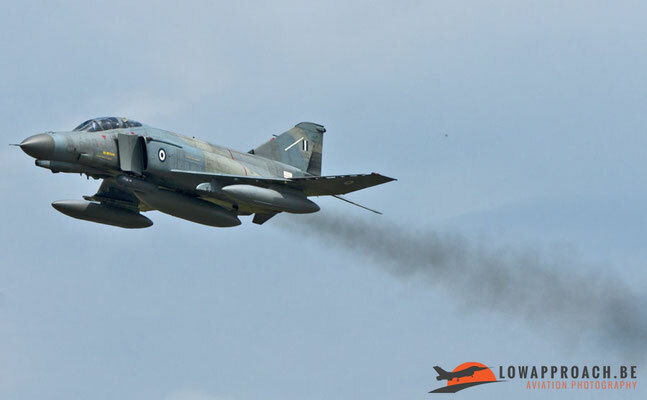 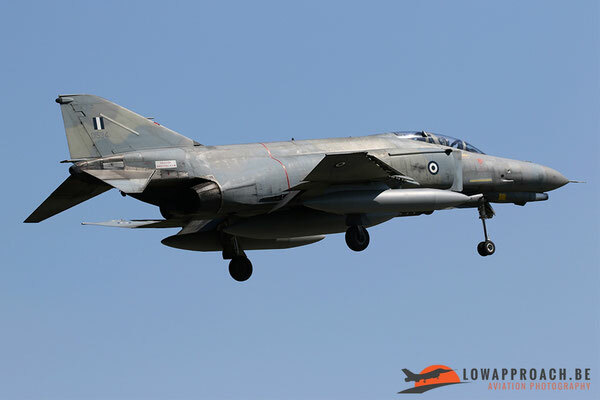 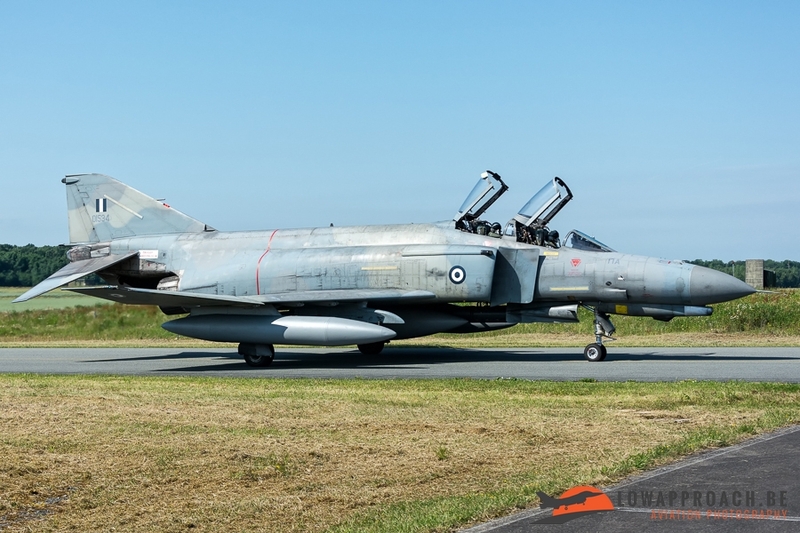 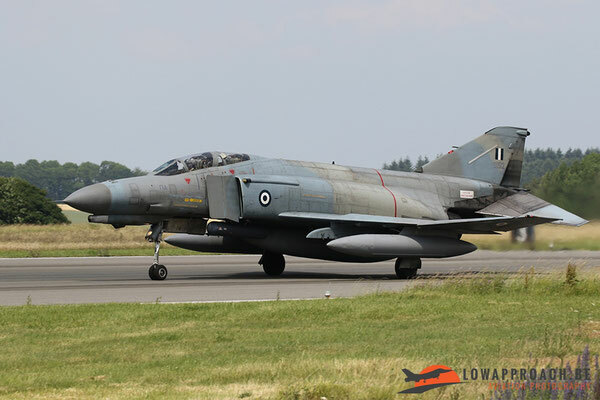 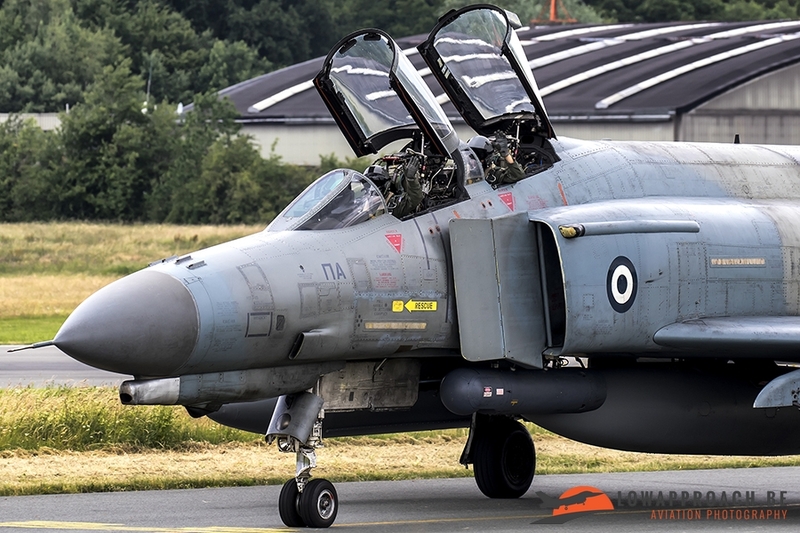 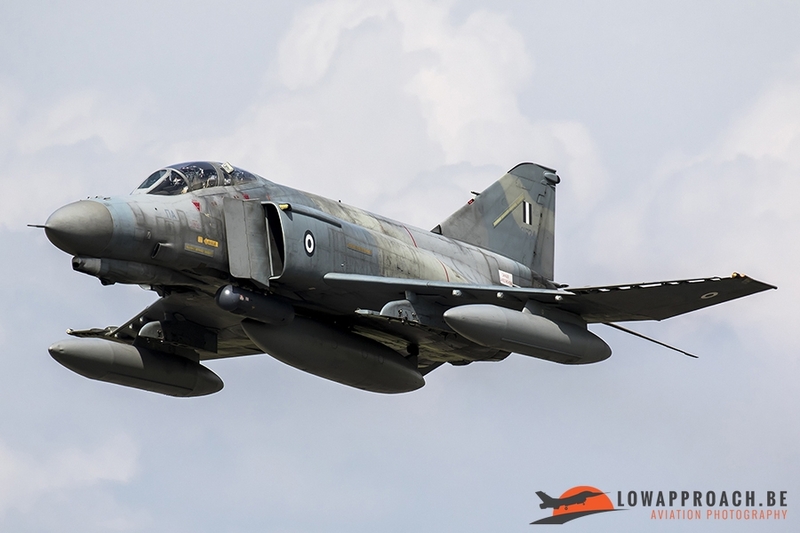 This being the Hellenic Air Force’s F-4E’s. 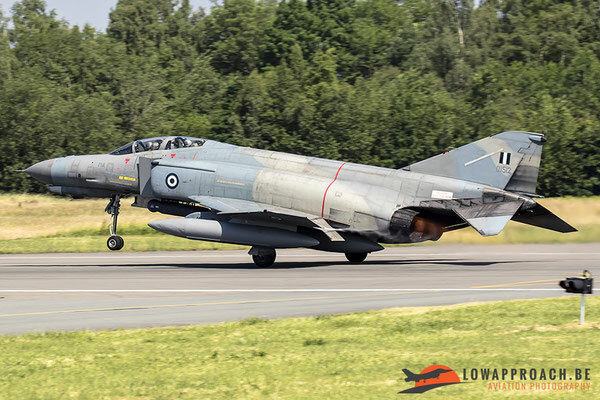 The pilots made some nice approaches with this old workhorse before putting the wheels back down on the asphalt. Like already said, the spottersday was held on the last day of the exercise. 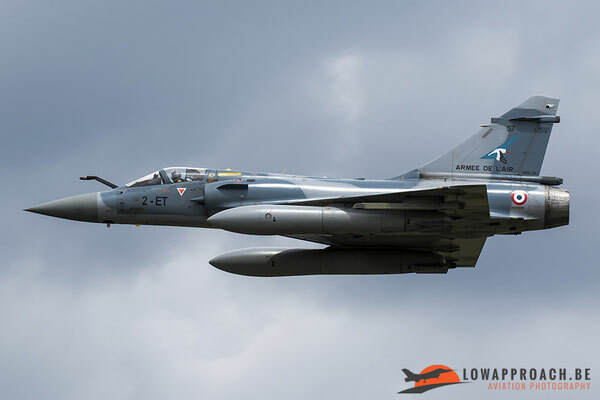 So we were lucky to catch some support planes that already came to Florennes. 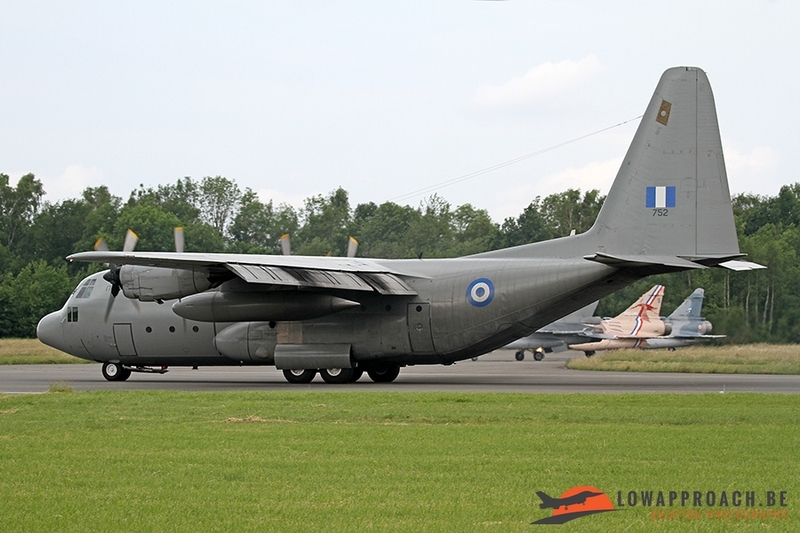 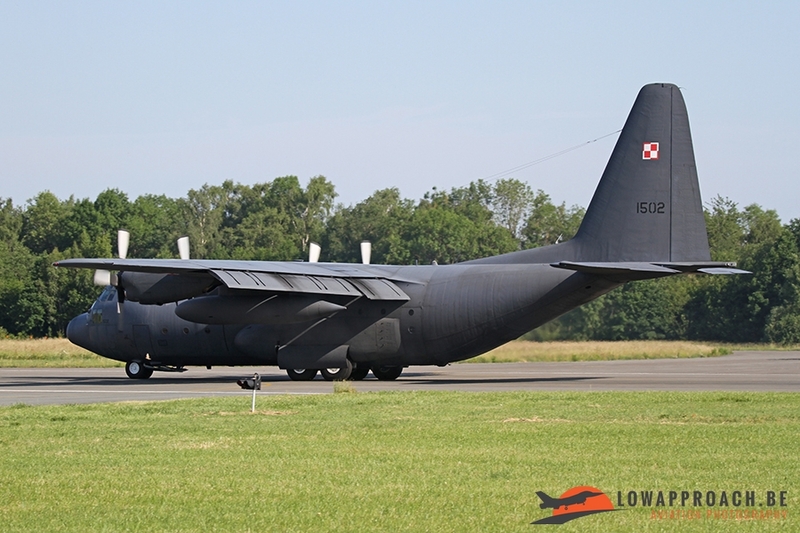 The support planes came in the form of 2 C-130 variants, one being a Polish Air Force example, the other one an Hellenic Air Force example. 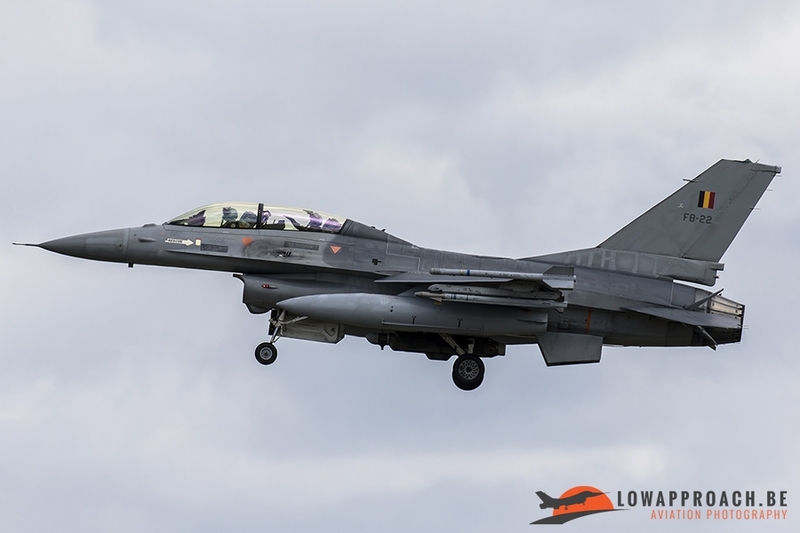 As the icing on the cake the spotters were also treated on a test flight from a locally based F-16AM at the end of the day. 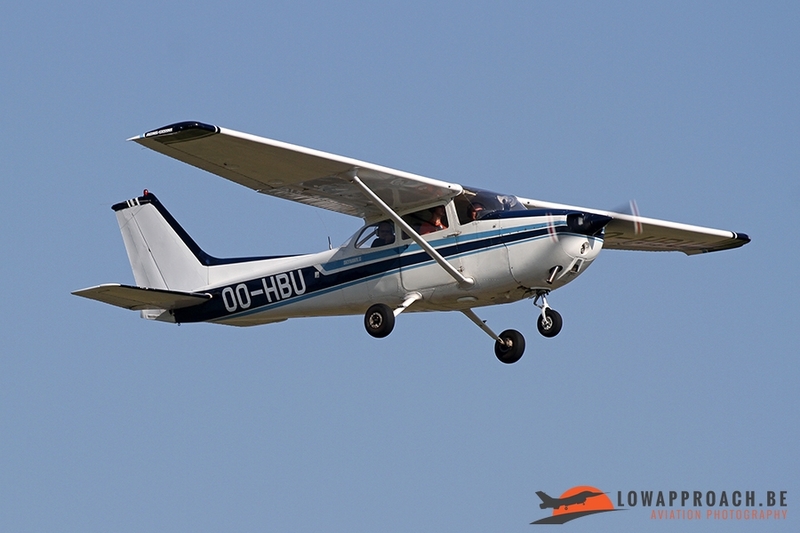 To conclude, we from Low Approach, can say that the spottersday at Florennes was extremely well organized. 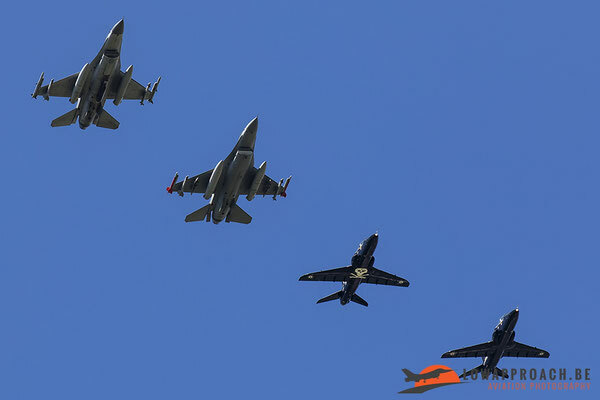 It was one of the best spottersdays from the last years, the organization really knew how to please the spotters. 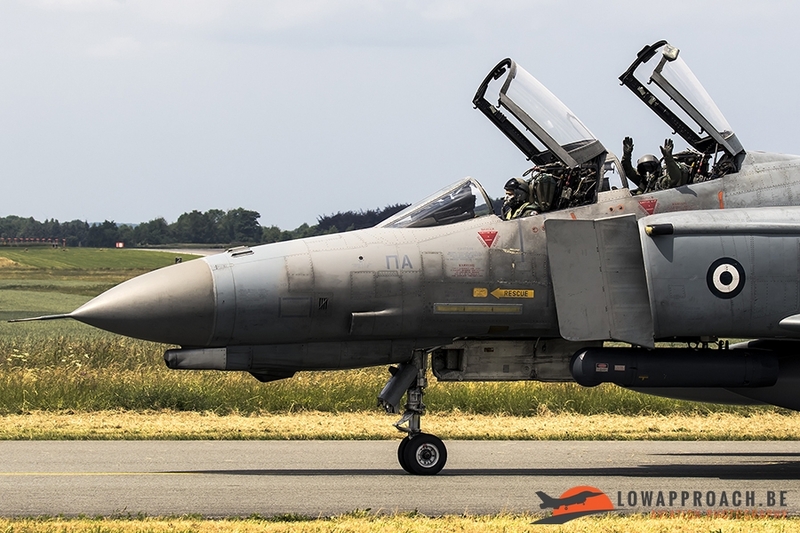 We were positioned on a really great location and all the pilots made some great low approaches, touch and go’s, overshoots to the happiness from the spotters. 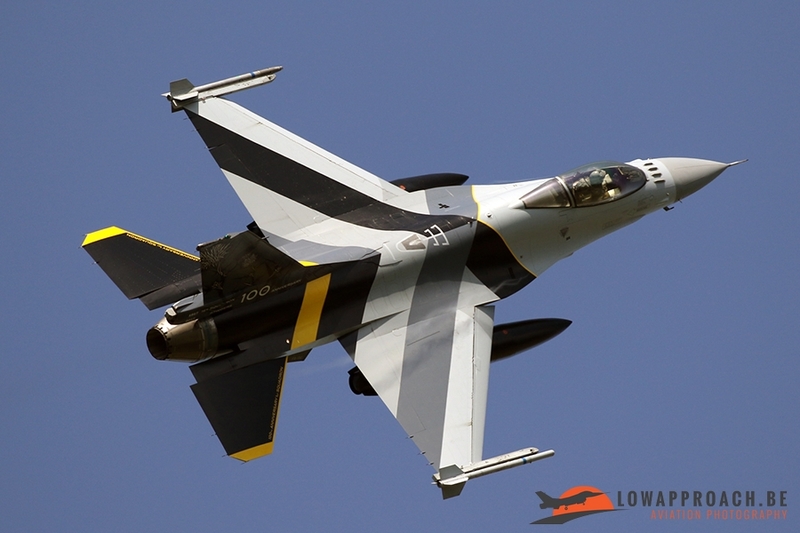 We want to thank the 2nd Wing and 1st Squadron for organizing this event. 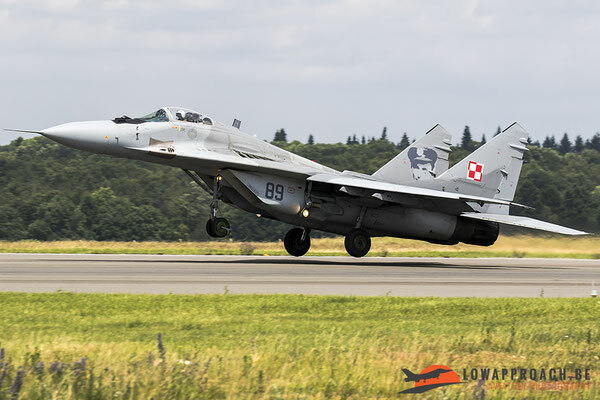 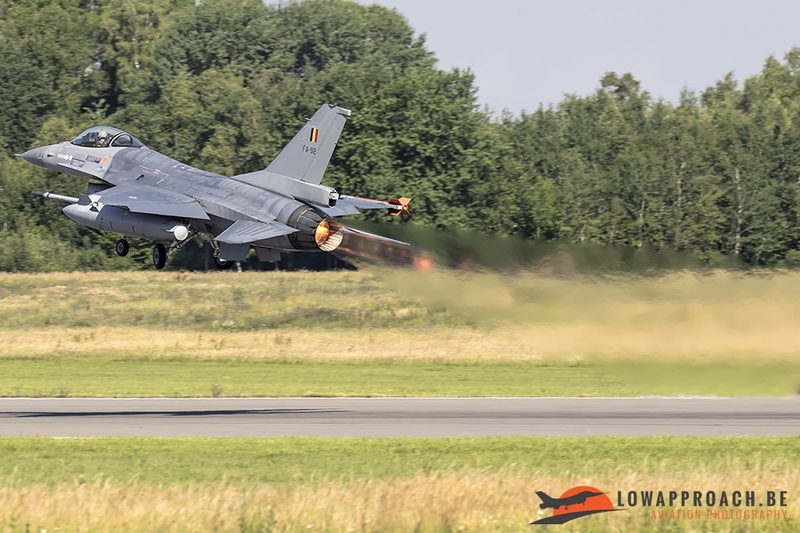 We hope that in the future more of these exercises can be organized cause it brought back a lot of nice memories to many spotters from the good old days when the TLP’s were still held at Florennes.